The three Horween leathers with such resilience that they will accompany you to even the world’s end: waxed flesh, roughout, and reverse chamois. These leathers won’t need any conditioning for a long time. The wax makes the roughout very resilient to rain, scuffs, and other elements. I did, however, decide to apply 100% Pure Neatsfoot Oil to my pair of Aldens in Reverse Hunting Green Chamois. Neatsfoot oil is a yellowish oil made from the shin bones of cows and is typically used to soften leather such as breaking in a baseball glove. The color of the boots out of the box seemed a bit too light for my liking. Neatsfoot is known to darken leather and it definitely darkened it to a deep forest green. The reverse chamois leather feels “damp” and cold to the touch, and surprisingly, it’s really, really supple compared to a roughout leather. The brown and black waxed flesh arrived with their nap completely waxed (brand new black waxed flesh pic below). Waxed flesh when new feels both smooth and rough. You can see in pictures now that some parts of the boots still remain smooth. My Viberg x Palmer Trading Co “Bad Seed” Waxed Flesh Service Boots brand new before wearing in 2015. What happens over time is that the wax comes off with wear, kicking objects, or even computer chairs rubbing against the heels. The brown pair (which started off a very dark brown) has areas lightened up to a medium brown with the nap/texture revealing itself. The black waxed flesh has revealed shades of grey underneath. To test out the water resistance of every pair, I poured water on all of them. I wasn’t too thorough in scientifically testing them because in hindsight I would have weighed each boot before and after pouring an equal amount of water on them. That way, I’d be able to figure out which boot absorbed the most and which repelled the most. From observation, the reverse chamois had the greatest water resistance. But it was likely because that boot was recently oiled. If all the boots were brand new, I’d say the order would go from Waxed Flesh > Reverse Chamois > Roughout in water resistance. Of course, all these leathers innately have high water resilience so the difference is negligible. I wouldn’t hesitate to bring any of these pairs in rain, snow, or slush. Just be sure to dry them thoroughly afterwards! My absolute favorite leather from Horween is Chromexcel – specifically Natural Chromexcel. I love the color depth and variation when the leather ages. I’ll show a before and after conditioning of my 3-year old pair of Viberg Service Boots in Natural Chromexcel. Horween’s other leather/tannages such as Cordovan, Chromepak, and Dublin all come really close as my runner-up favorites! 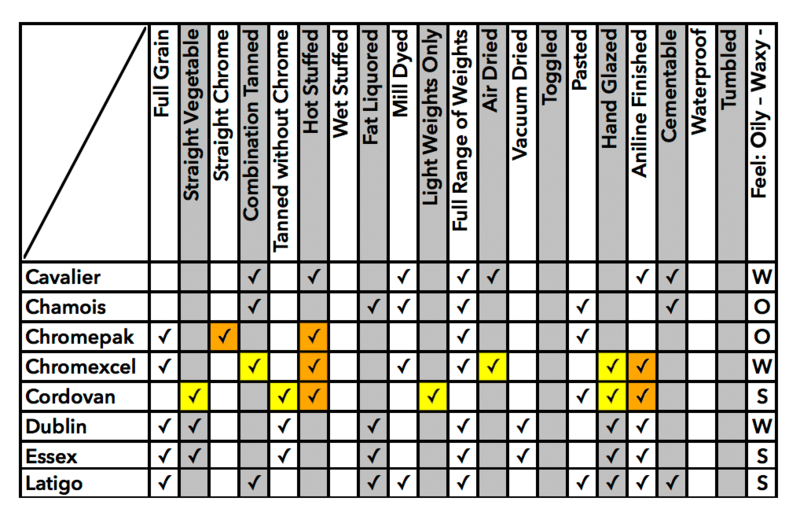 Here is a tannage chart taken directly from Horween’s website. 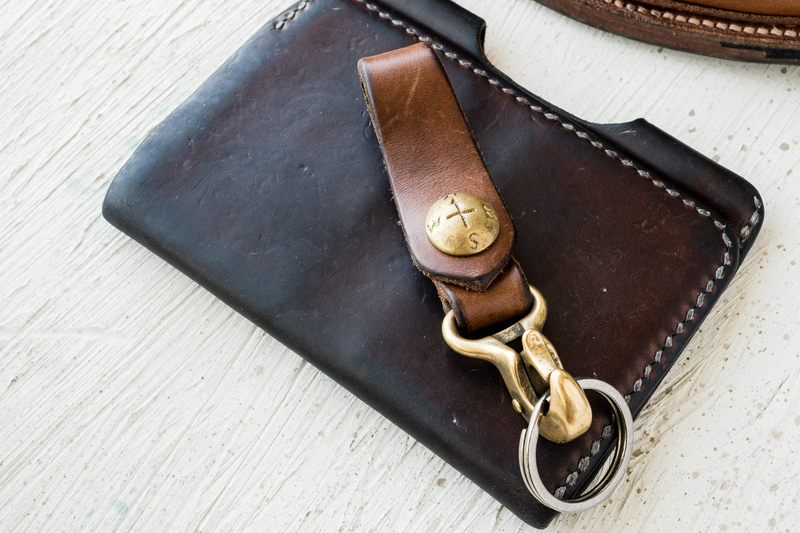 Out of the 51 leather types listed, I narrowed the list down to 8 of the more commonly used tannages for leather goods. I highlighted what I feel are the key characteristics that makes Chromexcel unique, and I’ll briefly go over each. Because Chromexcel is a tanning process and not a leather type, you can have both cowhide and horsehide. It is also known as the “original pull-up leather”. Combination tanned: Chromexcel is both chrome tanned and vegetable tanned which brings in qualities of both processes! Tanning is the process of permanently altering the structure of animal skin. Chrome tanning is a faster method using chromium and makes the leather soft and water-resistant. Vegetable tanning uses organic tannins from trees and other plants along with other oils/waxes and creates a very durable leather. Veg tanned leather is not water-resistant, so water may stain. Hot stuffed: Chromexcel is heavily nourished with oils and waxes that creates the pull-up effect and water resistance. 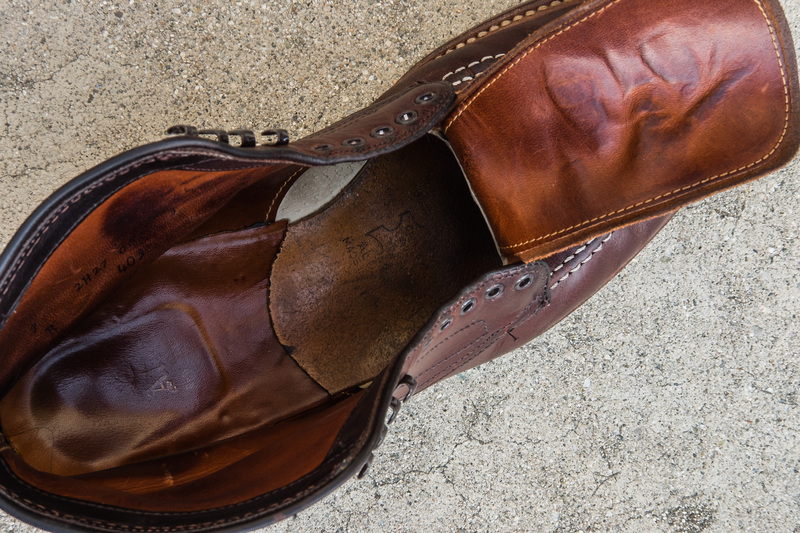 Air dried: Chromexcel is naturally air dried for about a week such that the leather shrinks to its original size. Aniline finished: The leather is saturated with soluble dyes such that the texture/irregularities of the leather is left untouched which is ideal for a raw enthusiast like me! These are a few of my other small goods in Natural Chromexcel. The most wears are probably seen on the One Star Leather Park Sloper and Hollows Leather Rail Belt as they were worn/used nearly every day. Both these are at about 3 years plus of age. If you don’t want excessive stretching on a belt, I’d shy away from CXL as it initially stretches significantly! The leathers of both pieces started off as a light brown oak color. 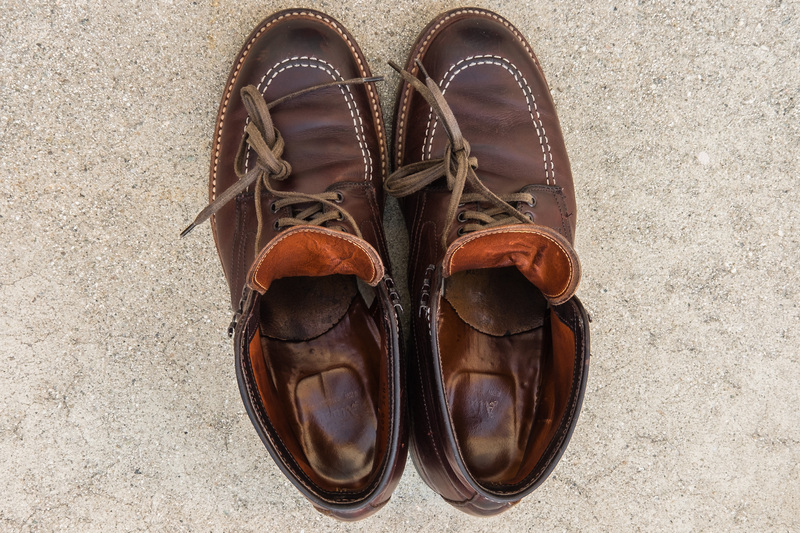 The leather color darkened quite quickly within the first few months to a rich brown by oils, dirt, and abrasion. I noticed that direct sunlight also sped up the darkening process. The leather also picked up significant indigo dye from my raw denim. After the initial and drastic color change, the color becomes quite saturated and will not darken all that more. I have not felt the need to condition the leather, and they both still display a lot of pull-up. With the amount of oils/waxes in the leather, most superficial scuffs/nicks have been easy to rub away with my fingers. When I purchased this pair, there weren’t too many pics of Natural CXL Vibergs online. There has been at least one similar spec MTO arranged by Styleforum around 2014-2015 but with an unstructured toe. I purchased this pair of Vibergs from Mr Porter back in mid 2015. I believe it was the second restock of this makeup on Mr Porter. When I received it a few days later, I was blown away by how thick the Natural Chromexcel was. The leather arrived with a significant sheen to it. It took quite a while for any visible crease to form (in contrast to my Viberg Color 8 CXL pair). For the price of $720 USD, I’m glad Viberg used high quality hides! The boots arrived with a small, adorable 1oz jar of Venetian Shoe Cream, a pair of flat waxed cotton laces, and a spare pair of brown rawhide leather laces in the box. I initially kept the flat waxed laces as I wanted the laces to accentuate the sleek, narrow 2030 last. Yet, I had a hard time deciding which laces suited the boots best. I eventually switched over to the leather laces after a few months. The flat laces reminded me much of the laces used on Alden’s boots (although this Viberg pair of laces were thicker and sturdier), and I feel that the leather laces fits the rugged Viberg brand aesthetic well. I like the pairing of brass eyelets with this leather. They seem to make the rich brown tones “pop”. 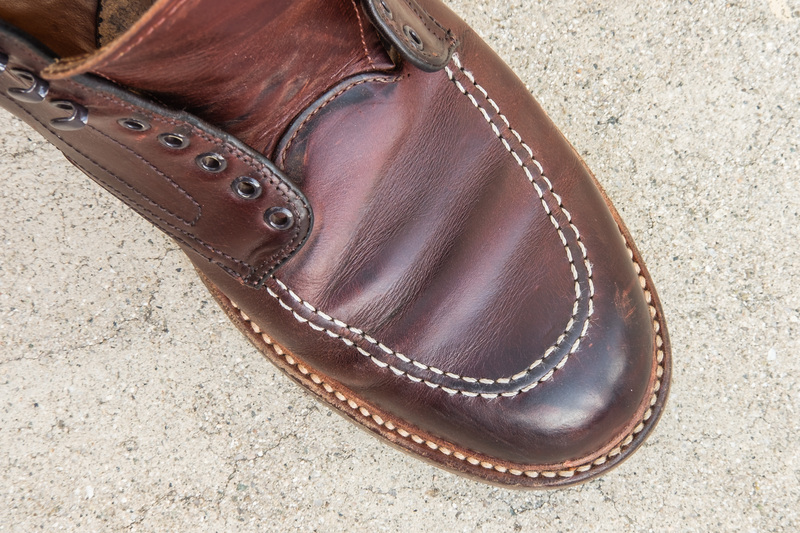 The toe box is partially structured and is further reinforced by the thick Chromexcel leather. While the right boot’s toe area has flattened a bit, the toe box is still quite firm to the touch on both boots. The boot tongue is also made of a thinner, softer Natural CXL which was different than my color 8 CXL pair that had a black contrasting oil tanned tongue. The black oil tanned leather is the standard go-to tongue for Viberg boots. I feel the CXL tongue fits this boot better than a contrasting one would. The leather used here is very much pliable, soft, and shows creases from the laces well. For conditioning/care, I’ve kept to a simple regimen of applying Venetian Shoe Cream every 6 months or so. I apply it onto the palms of my hands (minimizes loss from using a rag) and rub the cream onto the boot. I let the cream dry for a couple of minutes, I brush them down with a horsehair brush. Initially, the cream darkens the leather and provide a glossy sheen. The color lightens back near to its original after some time outdoors. Every few wears, I wipe the boots down with a damp rag and brush away any dirt with a Horsehair Brush. The cool thing about CXL is that you can rub away most scuffs/scratches because of the oils/waxes embedded in the leather. Down below is an example of superficial scuffs that went away after some VSC and brushing. I used a polished deer bone in circular motions in the area to create friction so the cream penetrates. Here’s a rear heel counter shot of a few pairs. You can see that the natural chromexcel pair on the left has minimal creasing compared to the color 8 CXL and Olive Chromepak. Compared to the other 3 pairs, the captoe on this makeup seems a bit shorter, but I hardly notice it when it’s not next to my other pairs. In conclusion, I think that Natural Chromexcel is an easy to care for, interesting, and beautiful leather. 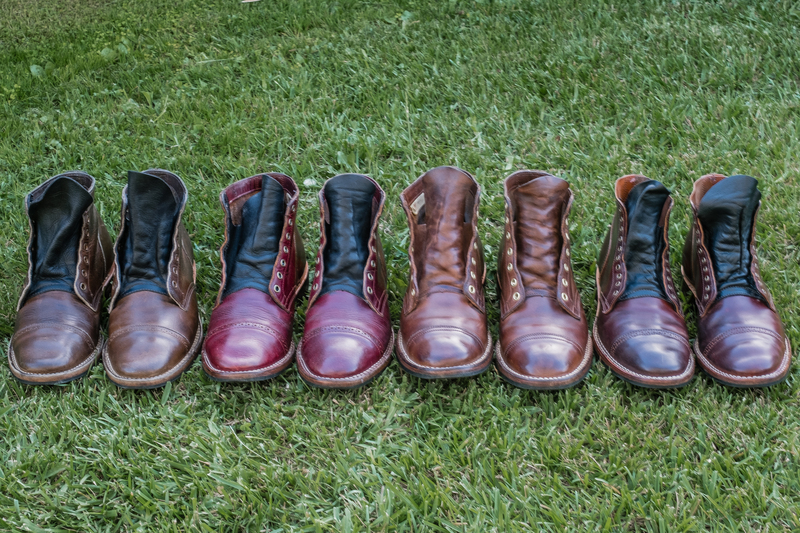 The selection of hides that Viberg uses on their boots is second to none. If I were to only own one pair of Vibergs, this pair of boots would be it! 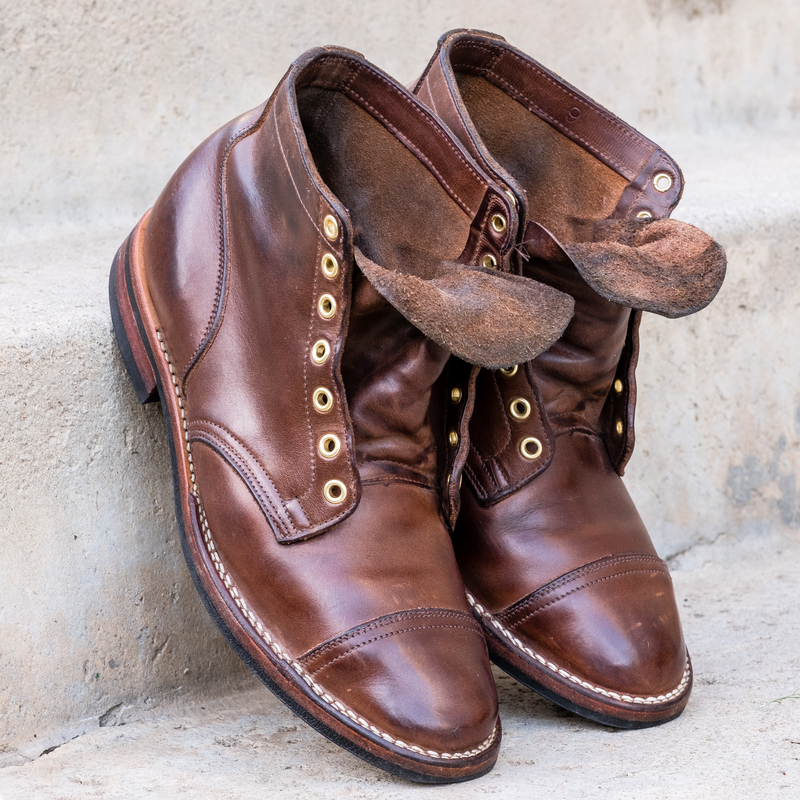 Although this exact makeup isn’t readily available, a handful of retailers such as Lost & Found, Brooklyn Clothing, and the Viberg.com site recently have stocked a Service Boot with this leather. 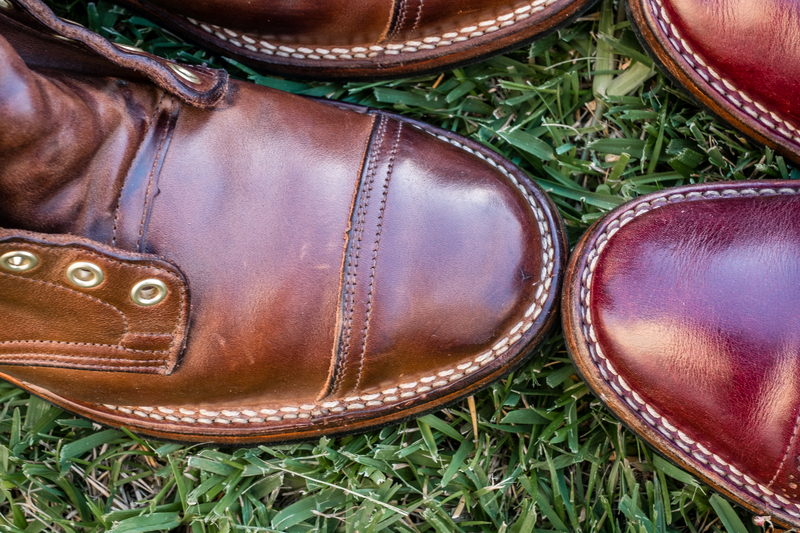 Ever since I have owned my first Alden pair of shoes in Color #8 Horween Shell Cordovan, I’ve noticed the color patina to a lighter shade over time. 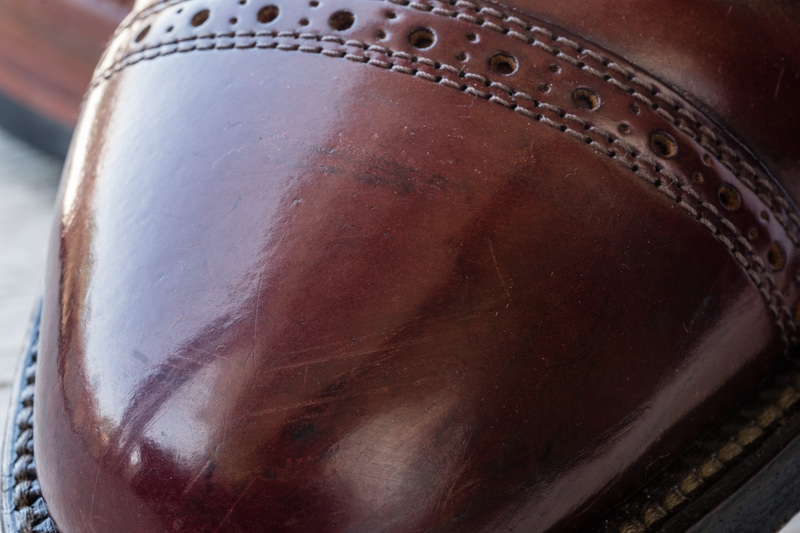 I’ve observed it happens most prominently with Alden’s Color #8 Shell Cordovan because the color starts very dark. 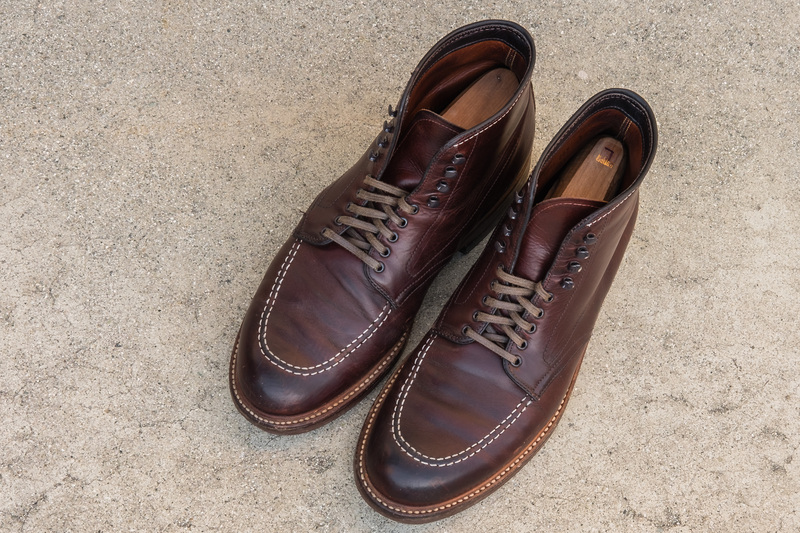 I believe that Alden treats their Shell Cordovan (from Horween) with their own glaze that provides sheen and glossiness. On the other hand, their color 8 chromexcel brightens up much more quickly. 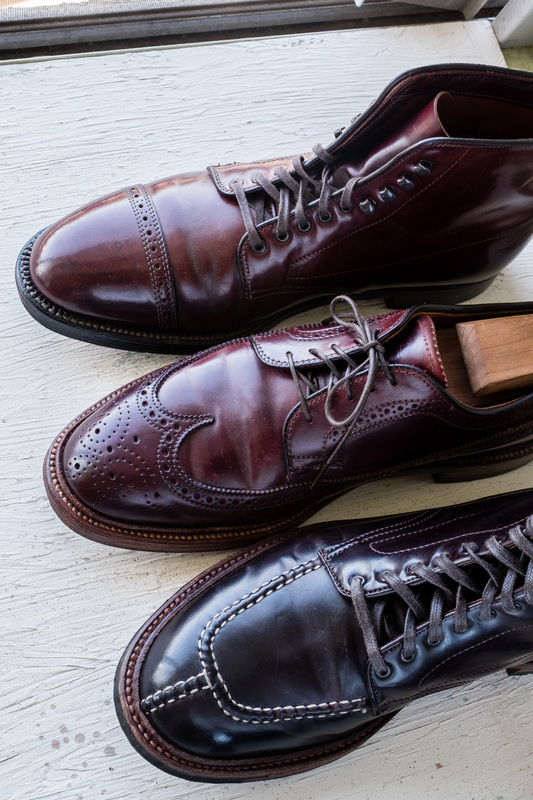 Every 6-12 months, apply some Venetian Shoe Cream to the cordovan sparingly, letting it dry, wipe down any excess cream, then back to brushing. 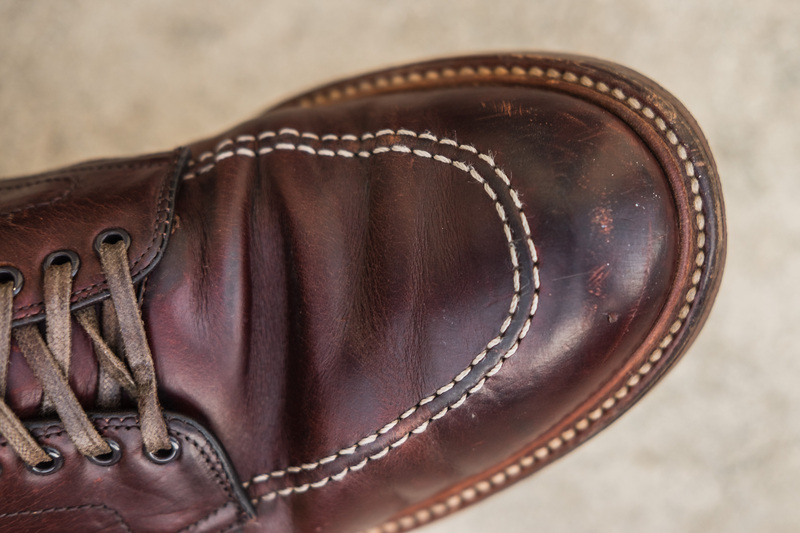 For any scuffs, I apply a small drop of Venetian Shoe Cream in the area and then use a Polished Deer Bone to rub circularly with light pressure. I’ve tried the Deer Bone without any cream and noticed it doesn’t do much. You can also use the back of a metal spoon to achieve similar results. I’ve yet to need to apply any wax based polish to the shoes. Recently, I feel that Alden’s Color 8 batches have been much darker than I remember. The color looks almost black unless in direct sunlight. 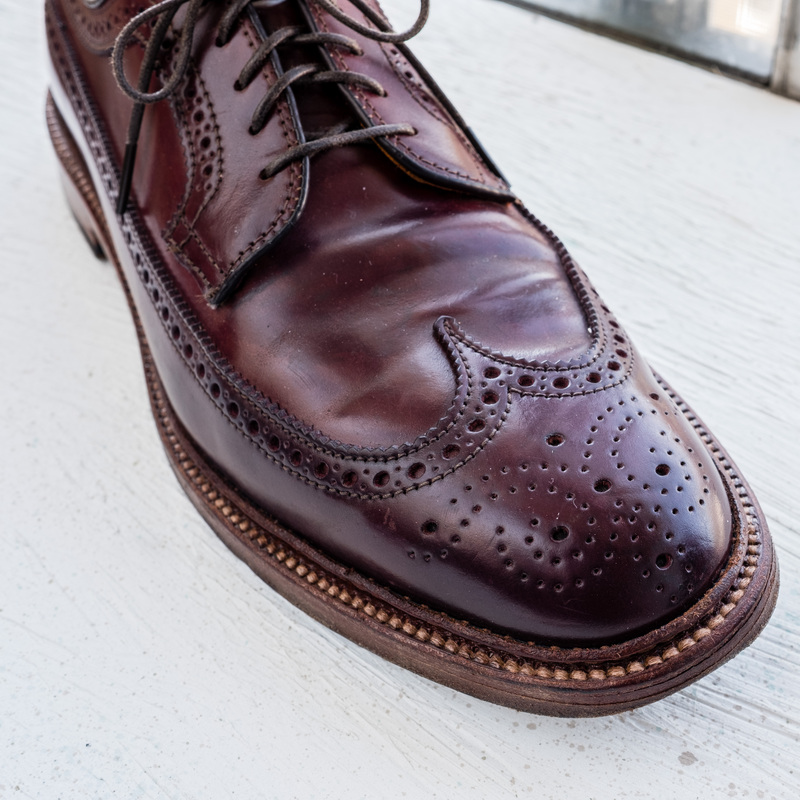 I believe much of the reason Alden re-dyes their Color 8 is to minimize any blemishes/scars the leather may have. 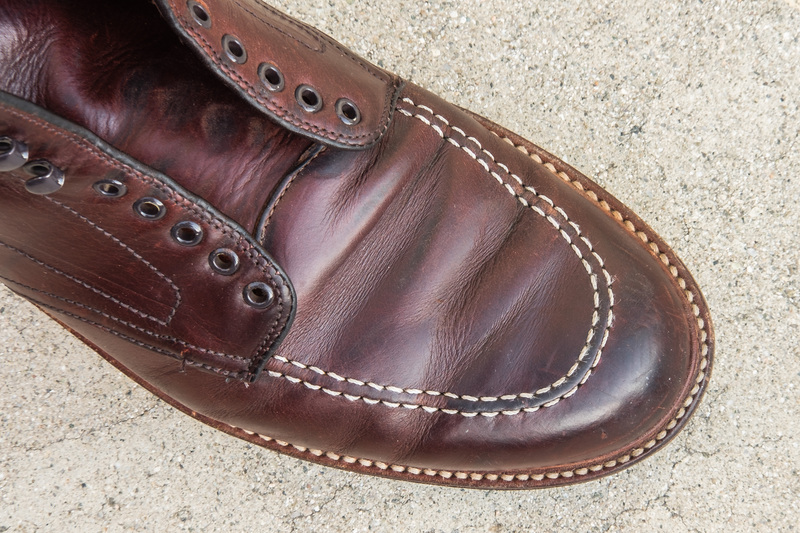 I’ve yet to determine what causes the lightening of color in the Color 8 Shell Cordovan. It might be pigments naturally degrading with age or even direct sunlight playing a role. 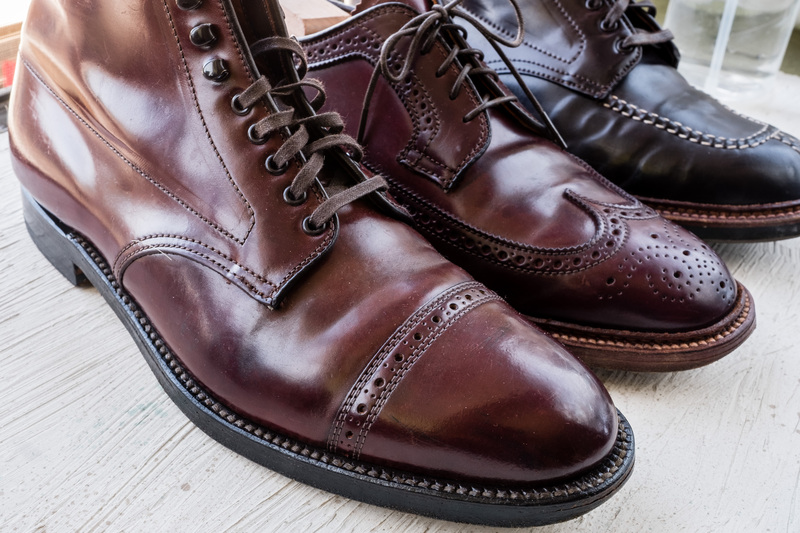 Either way, we each have our own perceptions of what Color 8 Shell Cordovan should look like – whether a very dark burgundy or a deep, vibrant red, Color 8 will always be king. 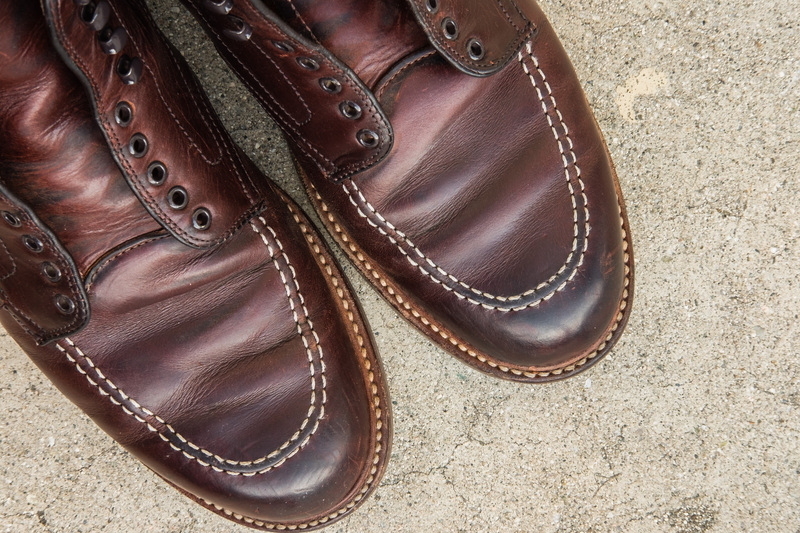 As color 8 shell cordovan lightens, the leather shows great character. I recently purchased Red Wing 8085 Iron Ranger in Copper Rough & Tough leather, worn them in for about 10 days before taking these pics. It took quite a bit of peer pressure jokingly from members of the LA Denim Hangs to persuade me to get these at Freenote Cloth flagship in Highland Park. 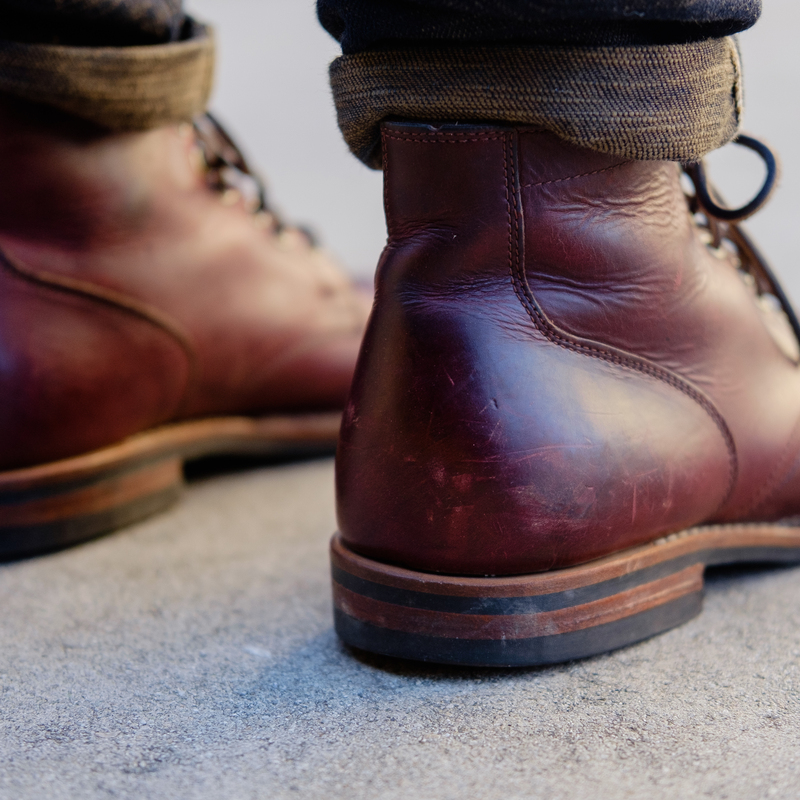 Copper Rough & Tough has been my favorite leather from Red Wing/SB Tannery for quite a while. I’ve seen pictures of the leather patina and it’s quite amazing! The leather has a pullup quality similar to Chromexcel. The leather starts as a reddish tan that darkens over time. I like things that get better with age. The price was discounted about $100 dollars off retail (subtly disclosed in person) because the store was trying to make space on their shelves for upcoming Truman Boots. I’ve noticed online that Red Wings go on sale very often, and even Red Wing seconds only have defects that I consider minor/cosmetic. 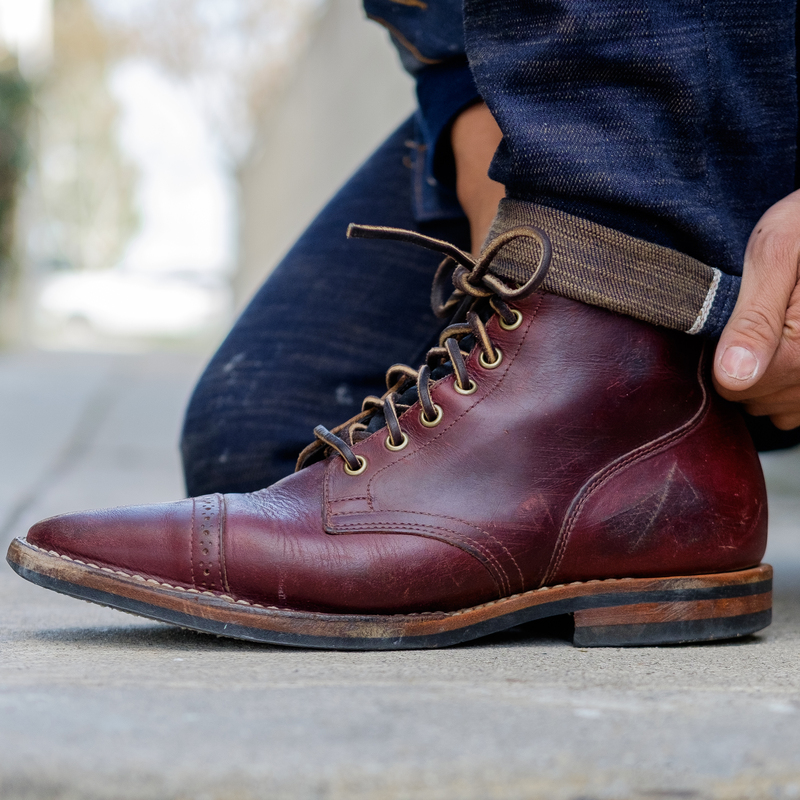 The Iron Ranger boot is a style I’ve wanted and it has speed hooks for easy on/easy off. 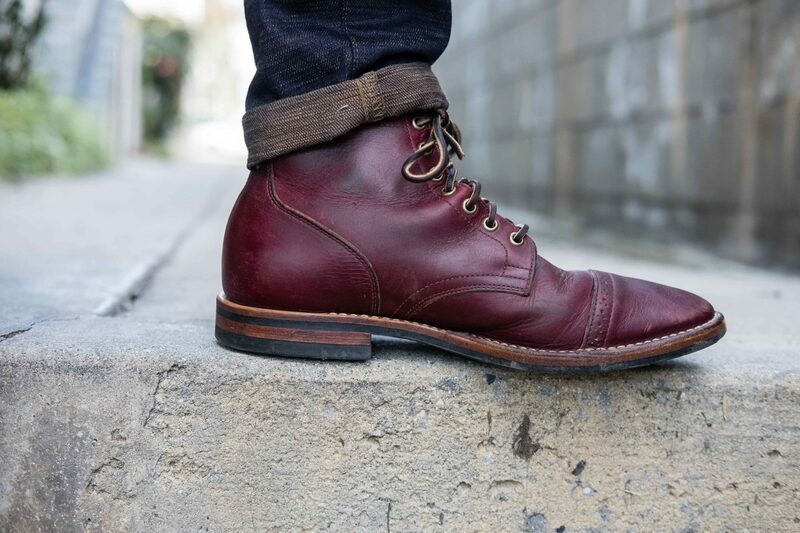 The only previous pair of Red Wings I owned was a pair of Red Wing 9011 Black Cherry Featherstone Beckman sometime in 2012. I’ve never had a break in period that tough with any other boot ever since. The Beckmans scraped my heels and made my ankles bleed the first couple of times. 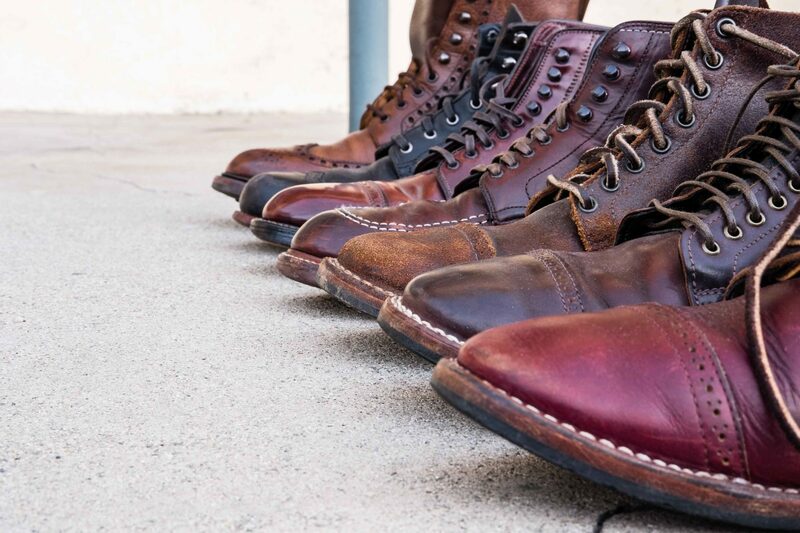 On the numerous occasions I went to San Francisco, I saw a total of at least a dozen Iron Rangers on people’s feet. The reason I sold the Beckmans not too long after I started purchasing Aldens and Vibergs. I felt the Iron Ranger design was most suited for my current aesthetic. It is a captoe boot with speed hooks in a lighter tan colored leather. I think that the Red Wing moc toe’s ventured too far into work wear than I’d like to be. I tend to like sleeker boots. I’ve experienced that Alden’s speed hooks are much harder to lace. Alden boots typically have 4 narrow speed hooks bunched together. It’s common that I miss a hook lacing up. The Iron Rangers have three speed hooks spaced decently spaced apart. 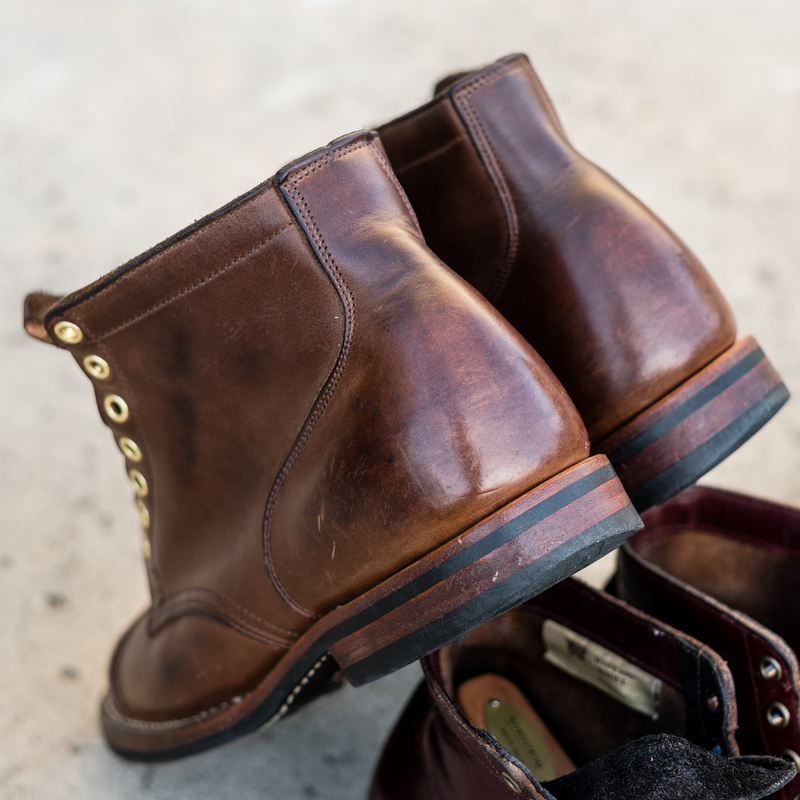 Red Wing shifted their typical soles on the Iron Ranger from a nitrile cork sole to a mini vibram lug sole which provides additional traction. I don’t live at all in an area where I need that grip, but I’d like the flexibility, and I’ve heard many people slipping on snow/ice with the cork sole. 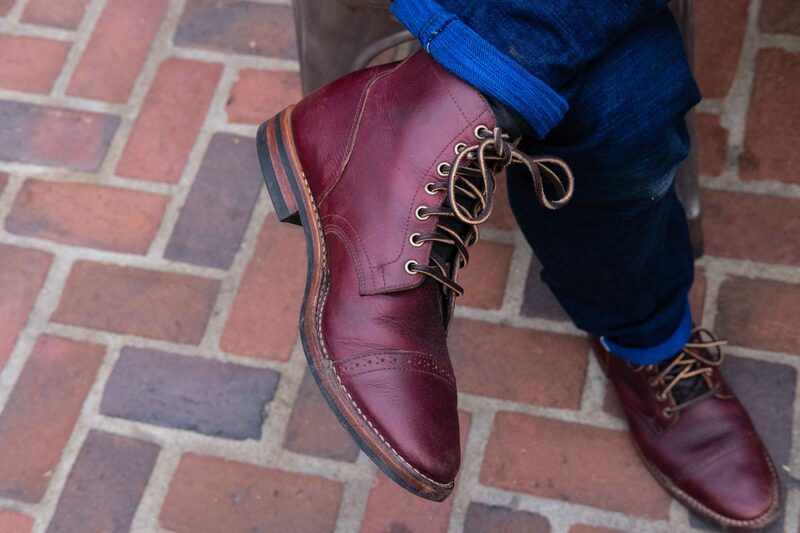 Red Wing is the American heritage boot company. 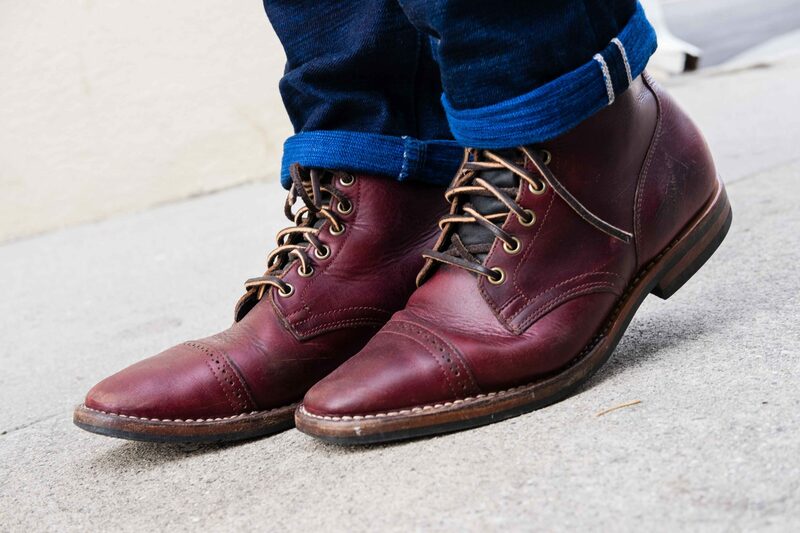 I very well respect what quality footwear Red Wing can offer at such a reasonable price. I consider them the best bang for the buck footwear you can get. 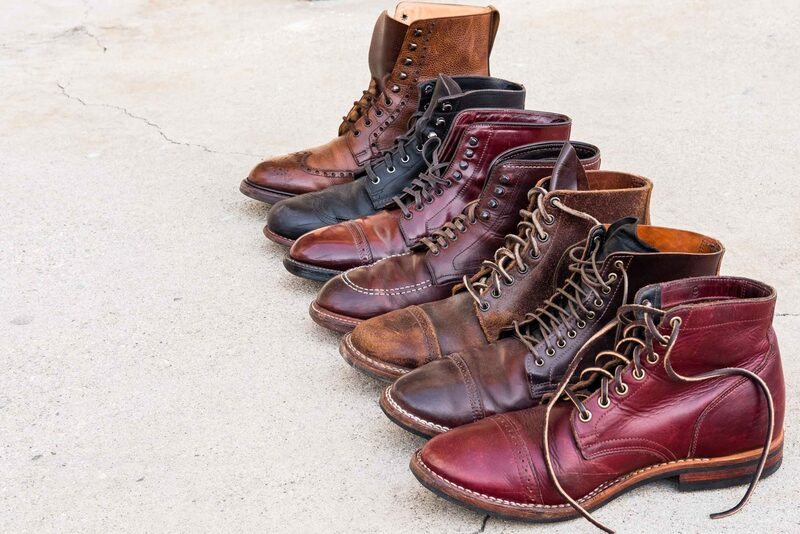 You can wear only Red Wings for the rest of your life and you’d be content. Once you move up into higher priced footwear, you’re paying premium mostly for the style rather than the construction/quality. The quality of the boot is solid. No missed stitches or extra threads hanging around. 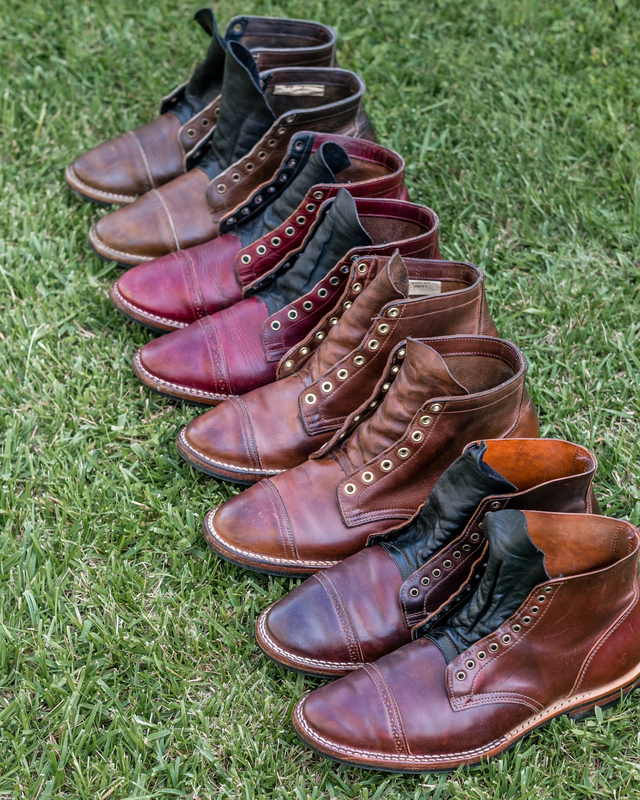 Red Wing is one of the best companies in quality control. 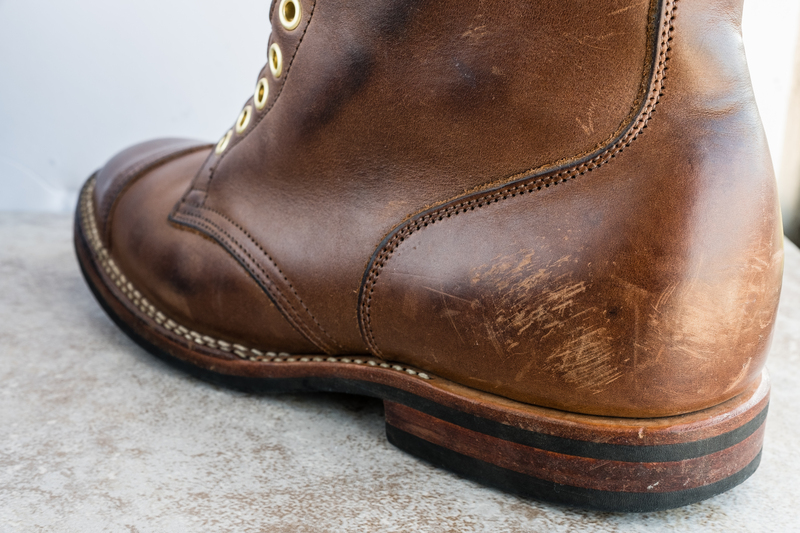 The Red Wing 8085 Iron Rangers took about a half dozen wears to break in comfortably. I sized them the same as I did with the Beckmans – a 9D. The part of the shoe that was most constricting initially was the width. I sped this process up by stuffing shoe trees wrapped with thick wool socks into boots every night. 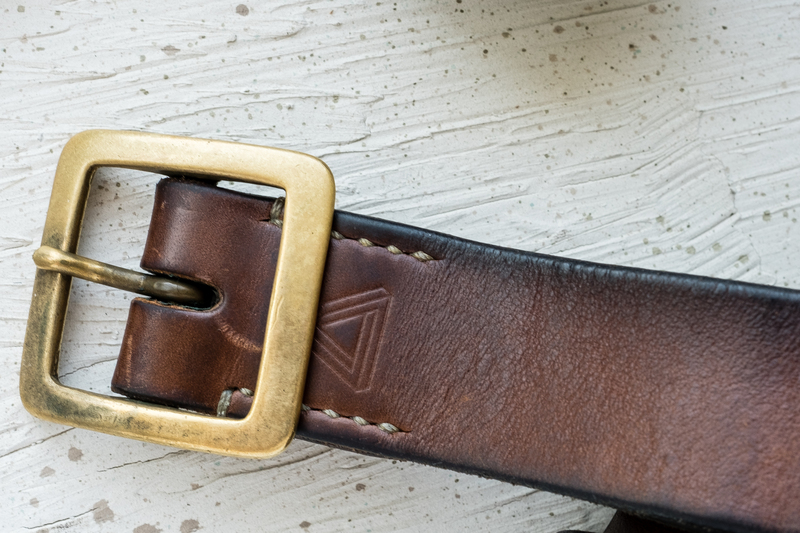 The Copper Rough & Tough leather developed character very quickly. I wore them during my day-to-day tasks which primarily consisted of walking. 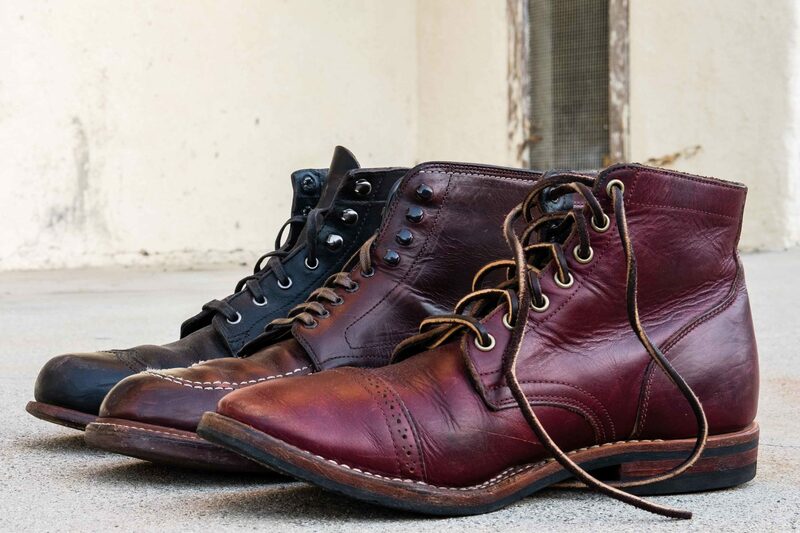 It was about a week and a half until I took the first pictures of them (maybe 9-10 wears) and I decided to compare them to my girlfriend’s growing collection of Red Wings and also my Viberg x 3sixteen Olive Chromepak unstructured service boots on the 2030 last. 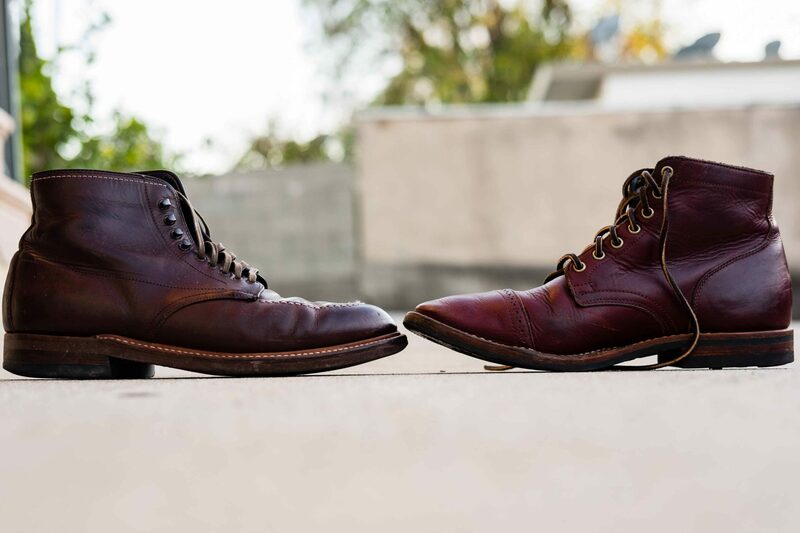 As far as I know, Viberg currently is not producing boots with an unstructured toe, so this comparison won’t be too practical. You can see the other toe structure comparisons in my other post along with my sizing. I keep an Excel spreadsheet of the dates and price purchased of almost all items in my wardrobe. 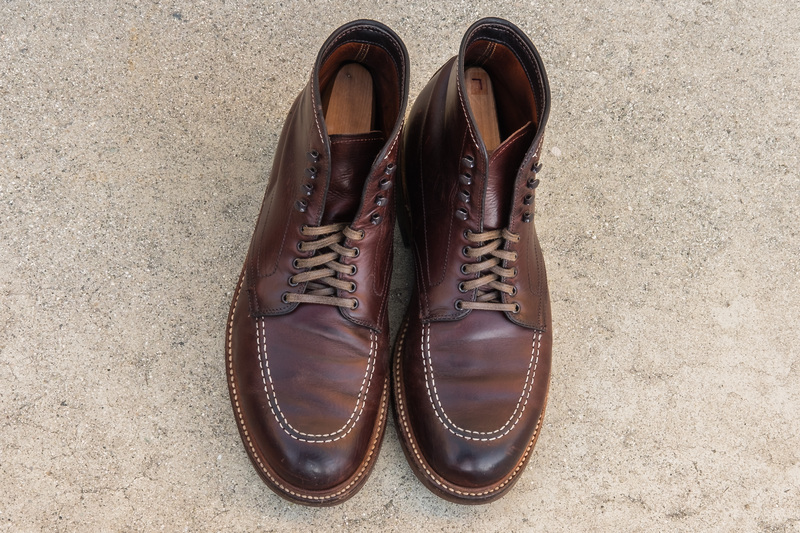 After several wardrobe overhauls involving selling my used pieces on eBay/Grailed, the Alden Indy 403 Boot in Brown Chromexcel is the oldest footwear that continually holds a spot in my wardrobe. The TruBalance Last. Alden Indy 403 on the left. Let’s take a journey back to the year of 2012, when I obsessively browsed /r/malefashionadvice and had just graduated college. 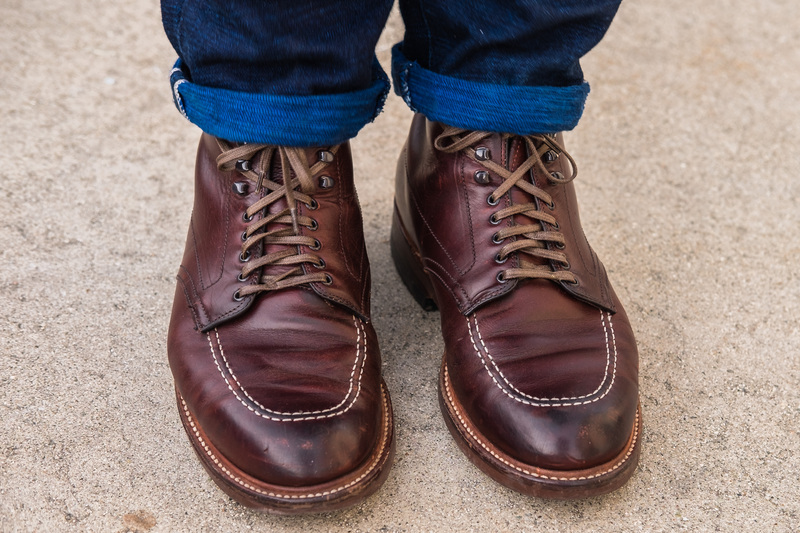 The Alden Indy boot was the bee’s knees back then on Reddit (and probably still is! ), the boot that Indiana Jones (Harrison Ford) wore. 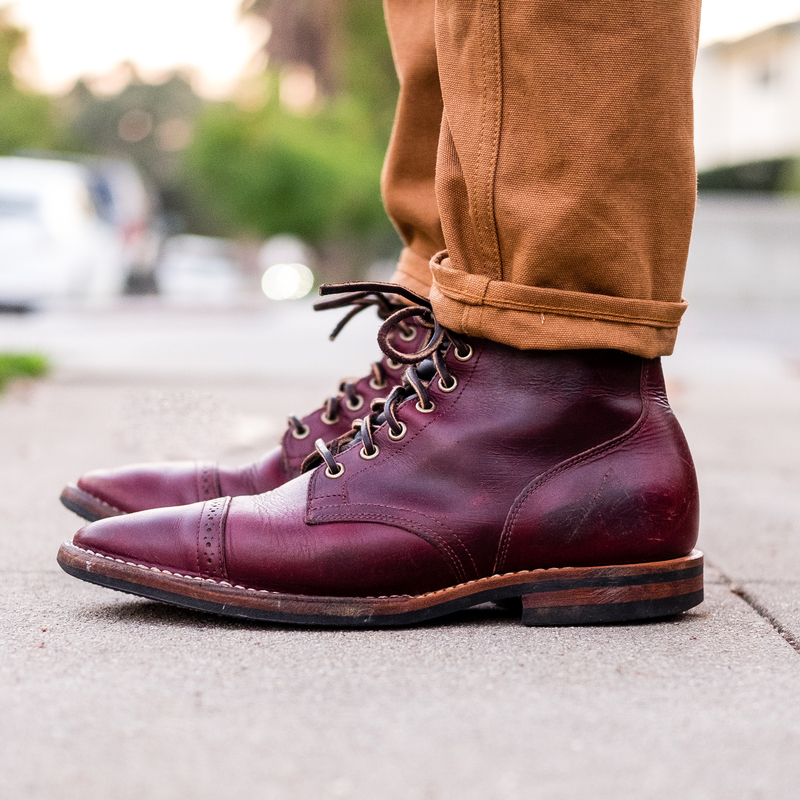 The footwear I recall owning at that time were a pair of Allen Edmond Strands in Walnut, Clark’s Desert Boots in Beeswax, and Red Wing Beckman in Black Cherry Featherstone. I had just purchased the Beckmans a few months prior from Amazon. The Beckmans were robust and very toe structured, and gave my heels quite a time breaking them in. However, I wanted a pair of quality boots that had a slimmer toe, were made in the USA, and were also versatile in many outfits as I was still trying to find comfort in my own style! Between the Alden 403 and 405, many more people recommended the 403 because of the interesting properties of Chromexcel . I wasn’t interested in the 404 because it appeared too rugged for me (Dark Brown Kudu Leather on a Vibram Lugged Sole). The Alden 401 in black, while also very beautiful, wasn’t one I considered because the black color would be more difficult than a brown color footwear to pair with. The appeal of the Alden 403 Brown CXL is that it would patina to show a great depth of color variation. 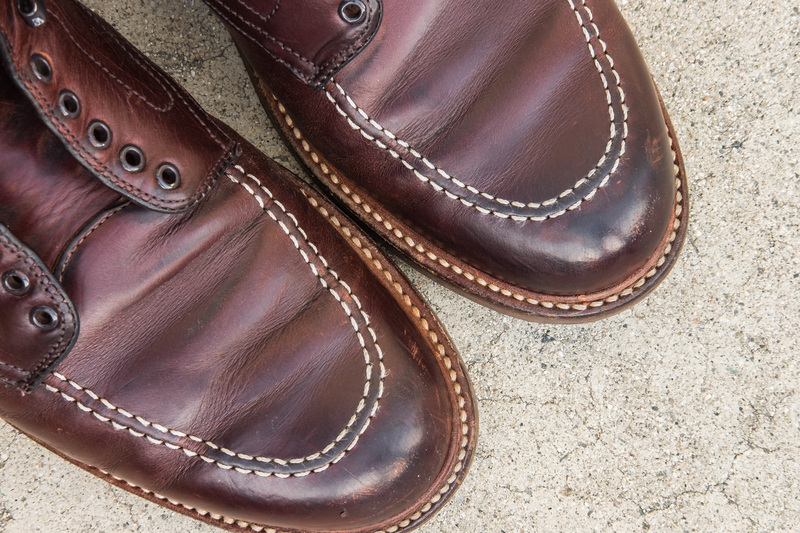 Plus, Chromexcel has the repuation of being quite an easy leather to maintain and to care care. While the Alden 405 in a lighter brown calf/cow were was the pair that Indiana Jones wore, the Brown Cowhide leather appeared a too tan and light colored for me. I love the color depth with Brown Chromexcel! It was around the time that Uniqlo had just opened their first west coast store in San Francisco. I scoured the internet for sizing advice knowing that my Red Wing 9011 Beckmans fit well. I came to a conclusion to purchase the same size in the TruBalance last (half a size down from my measured Brannock). I embarked on a journey to San Francisco with the destination of Alden SF on Sutter Street with a determination to purchase a pair Alden 403s. Cedar shoe trees are important in keeping their shape and absorbing moisture. I was greeted by one of the sale associates Robert, and I requested that I wanted to try on pair of Alden 403s. I was wearing a pair of Happy Socks (relatively thin cotton socks) and the pair of RW Beckmans. I remember another customer browsing in the store complimented my Red Wings, asking which model it was. I started trying on a size 9D that I knew most likely was my true size. And I also tried on a 9E and a 9.5D. While the 9E felt comfortable initially, I knew that CXL leather would stretch widthwise (but not so much lengthwise) and went with the 9D. Robert graciously threw added in a pair extra cotton shoelaces free of charge. I remember wearing the pair of 403s out the door and I walked a couple blocks to Uniqlo SF and my heels were starting to feel a bit tattered. I waggled my way back to the Caltrain and took the ride home. The Chromexcel leather started to form creases that eventually became permanent. Even though the Chromexcel leather was soft and supple, they weren’t 100% comfortable initially. It took a couple wears for them to break in. But compared to the stiff Red Wing Beckmans I recently broke in, the break-in period for the Aldens was almost negligible! The TruBalance last is quite wide compared to Alden’s Barrie last. Actually, it’s the widest last that Alden carries and can look quite chunky top down. The TruBalance last was designed for all day comfort, and I do agree it’s the most comfiest last I own. The insole has molded well to my feet, and I can easily wear thick wool socks (Darn Tough or Smartwool) with these boots. The Alden Indy boot used to have a duck cotton lining around 10 years ago instead of the full leather lining it has today. The stock laces that came with the boots were wide, 100% cotton, and burgundy tinted. The extra pair of laces that Robert added in were exactly the exact same ones I read several reviews that noted the laces felt really flimsy and frayed teasily with the speed hooks that came with the Indys. Feeling the laces, I definitely agreed they felt quite cheap and shortly after I ordered a pair of flat waxed brown laces on Amazon. The TZ laces that I ordered were densely woven cotten and haven’t shown any signs of wear over the years. I’d highly recommend the Brown TZ laces in 55″/140cm length which is perfect for the Alden Indy. 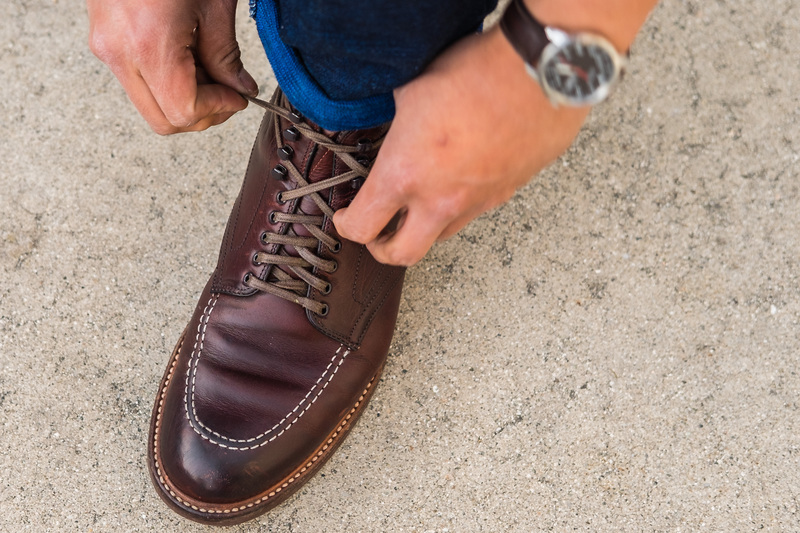 Another alternative is the stock Alden waxed laces that come with most Alden Shell Cordovan Boots. 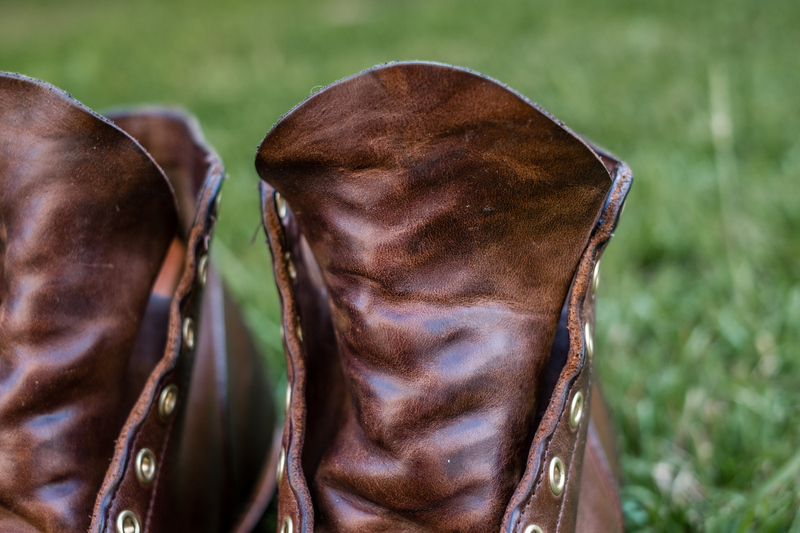 An issue that I have along with several others is that the tongue of the boot tends to slide outwards after lacing. 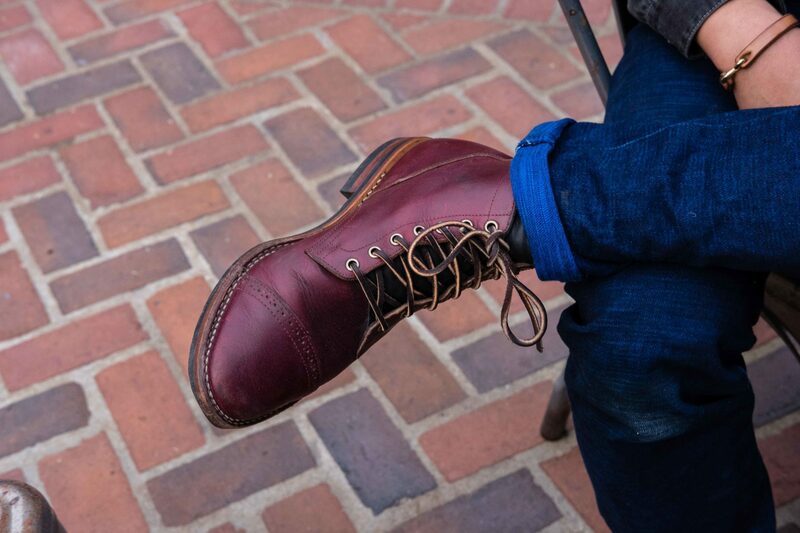 The Indy boot has a free, non-gusseted tongue (a tongue sewn to the upper behind the laces, preventing debris from entering) which most prominently on my left boot tended to slide outwards after walking a few steps. I’ve heard of people who took their pair to cobblers to have them stitch the tongue to be gusseted which fixed the problem. However, I hardly felt any difference in comfort with this issue. My girlfriend once time did notice this issue when I was lacing up and pointed it out. 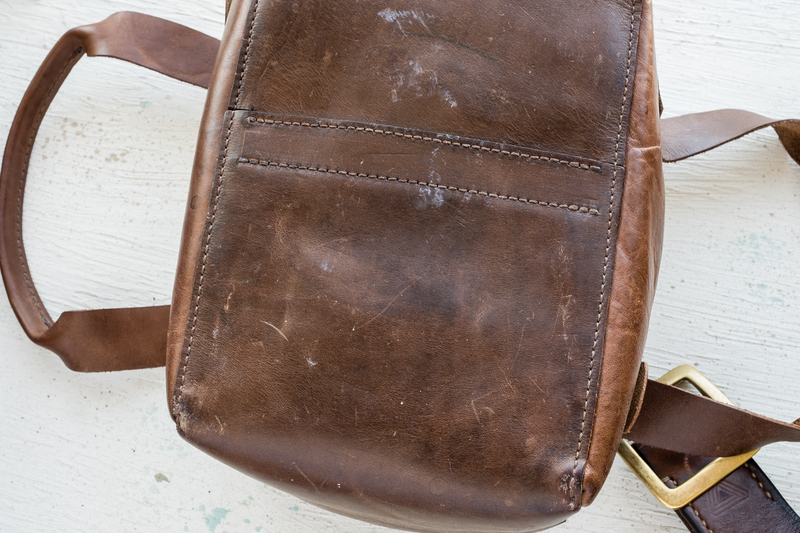 The brown Chromexcel leather started off as a medium brown and has darkened a bit to a deeper shade of brown. Chromexcel is an easy leather to care of, although it does scratch/nick easily. 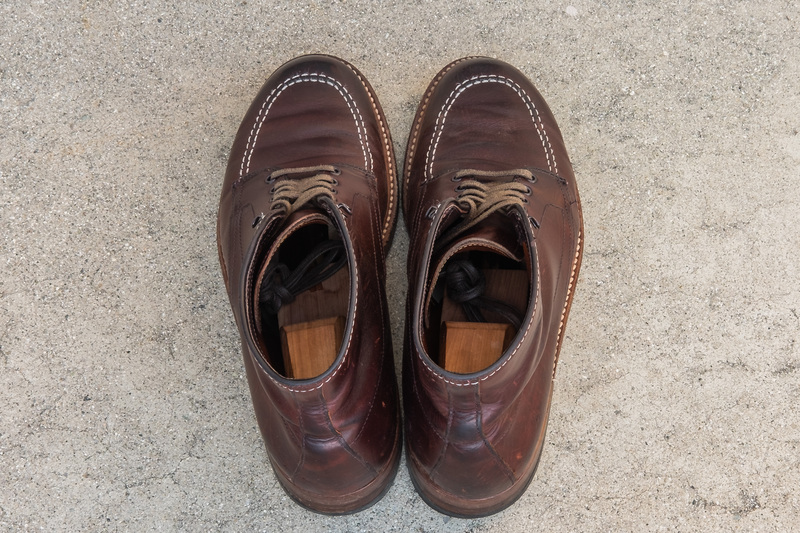 I always place in cedar shoe trees inbetween wears to absorb moisture and help minimize creases. My typical maintenance care is to wipe the boots down with a damp microfiber cloth and then to brush vigorously with a horsehair brush. The brushing will help bring out the leather’s oils towards the surface and also to provide a shine to the leather. A few times a year I use a small dab of Venetian Shoe Cream, rubbing it in with my fingers (prevents wasting cream by using a cloth) to condition the CXL and follow with a extensive brushing. 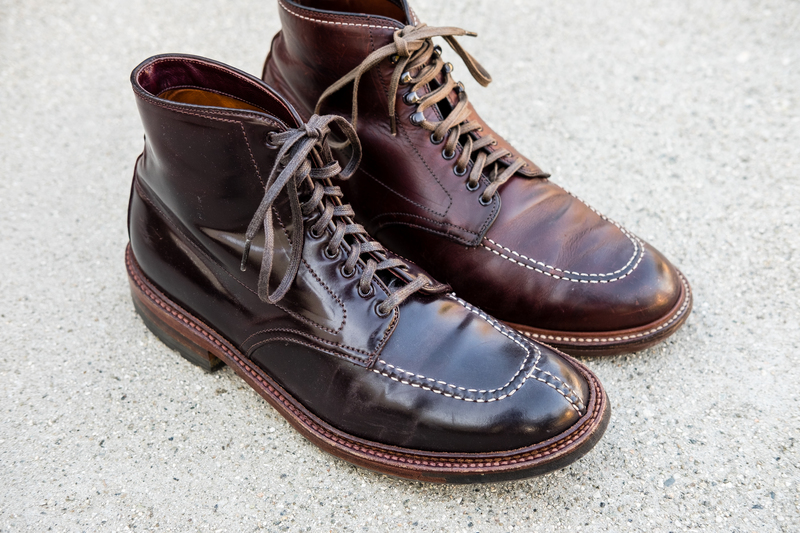 Venetian Shoe Cream is what Horween Leather of Chicago recommends. 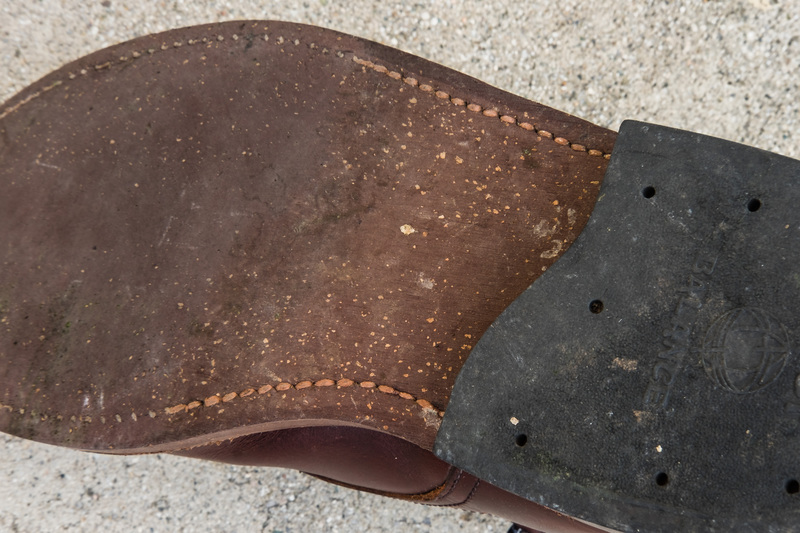 One issue I will address soon is that the Foot Balance Heel included with the boot have worn away. My Alden x Jcrew Captoe boots with a dovetail leather heel (purchased not long after) are not as worn down as these. Alden’s recrafting services does not include replacing only the heel, so I soon will have to bring them to a local cobbler. A pair of Foot Balance replacement heels can be ordered through Alden directly either through email or calling their 1-800 number. They cost around $16 for a pair. In regards to keeping the moc toe stitching white, I use several Q-tips with a dab of dish soap and some water to go over each stitch on the moc toe. Some of the areas around the stitching will lighten up because of the soap, but the end I brush the whole area and the brown color generally restore. I don’t use any polish for the Chromexcel leather because I feel that the contrasting stitching is what makes the Indy boot what it is. Some people take Obenauf’s Heavy Duty Preservative, Neatsfoot Oil, or Snow Seal to the whole boot to weather seal them because of necessity for their their climate. In doing so, however, the stitching will likely darken. 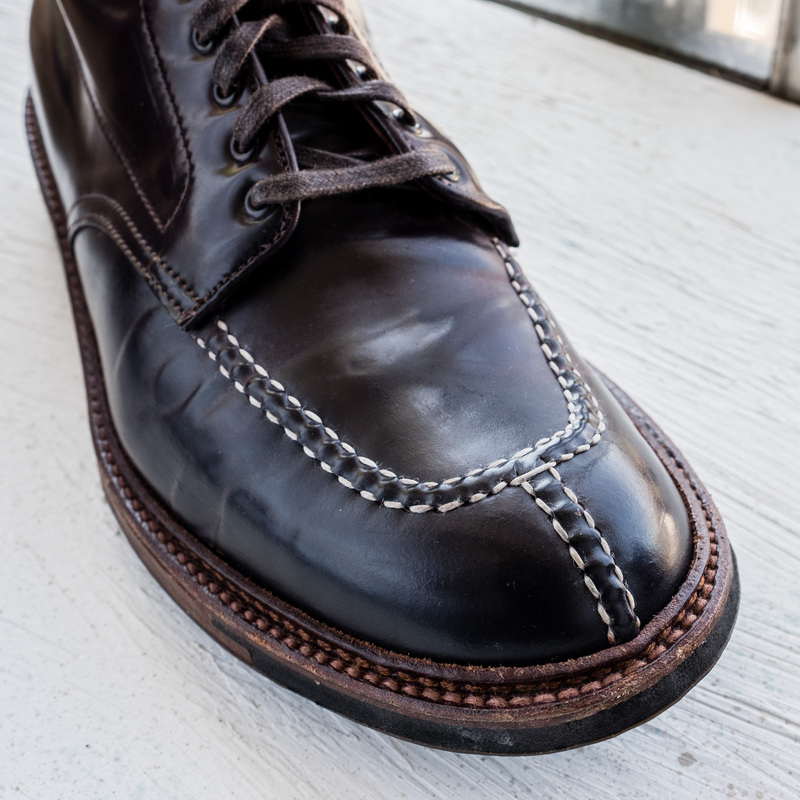 The Alden Indy 404 in Brown Kudu is a good example of how the boot looks without any white contrast stitching. The Neocork (Cork nitrile) sole looks quite sleek and is flexible. I wouldn’t recommend this sole for snow or icy conditions, but instead would recommend a commando sole. 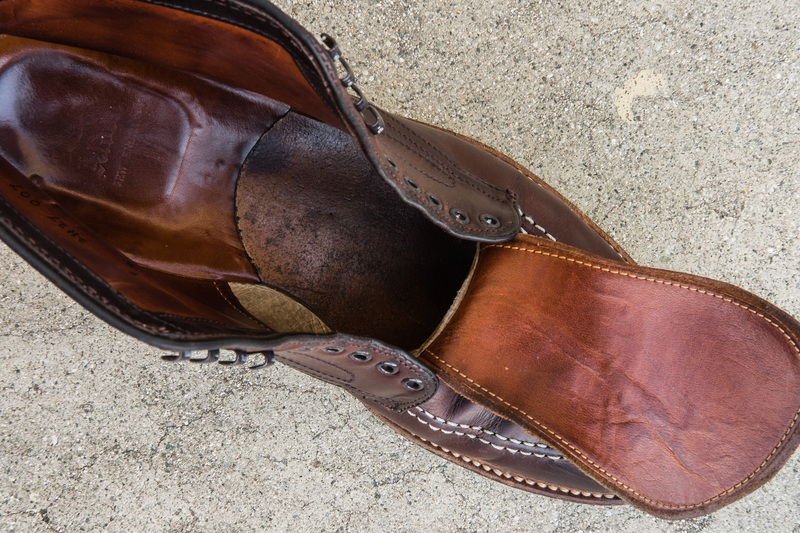 It is a rubber lug sole that attaches to the front half of the boot. 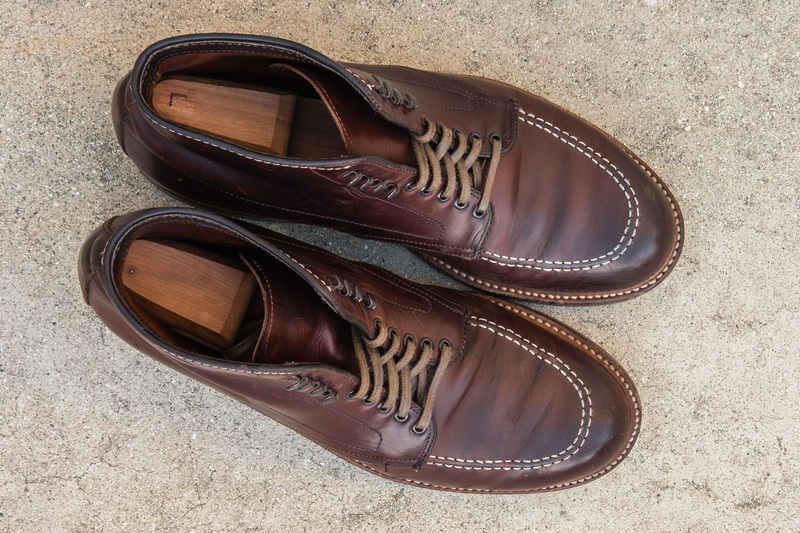 There have been a handful of Alden Indy makeups in the past that have used a commando sole. The Neocork stock sole provides a slight bit more traction than a leather sole, and I haven’t reached the point where I needed a full resole. Since I purchased the Indy, I’ve worn them about once every two weeks. For many people including me, the Foot Balance heel will wear out faster than the sole because of their gait and will need replacement first. 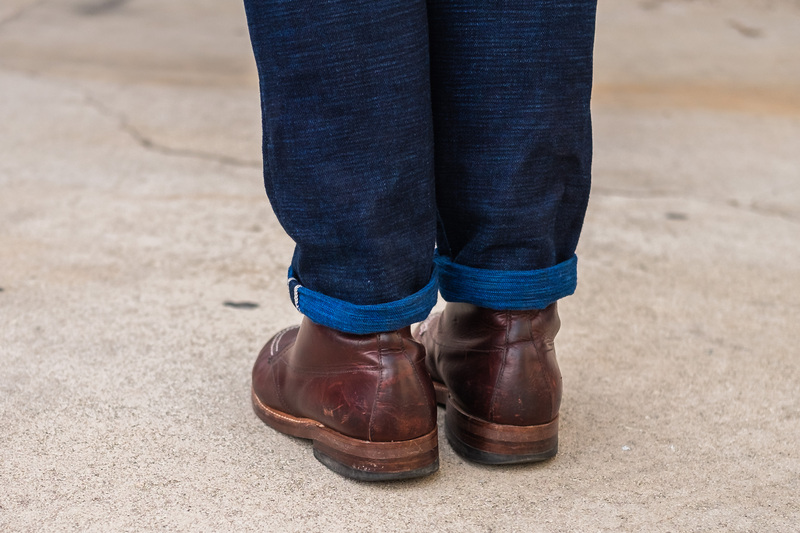 I’ve owned my pair of Alden Indys for more than 5 years, and even considering the new footwear brands that have emerged in that timeframe, I would still recommend them. Alden’s prices have been increasing by $15-20 dollars every year due to inflation. I jokingly say that Alden’s are worth putting money into as stock. 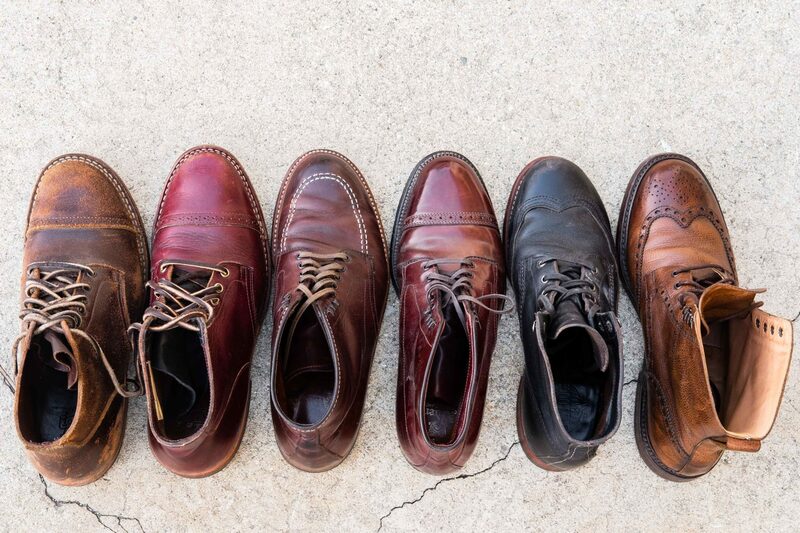 From what I’ve seen, the 403 Brown Chromexcel develops more variation in leather than the 405 Tan Cowhide. For most people, the 403s will mesh well with their wardrobe. 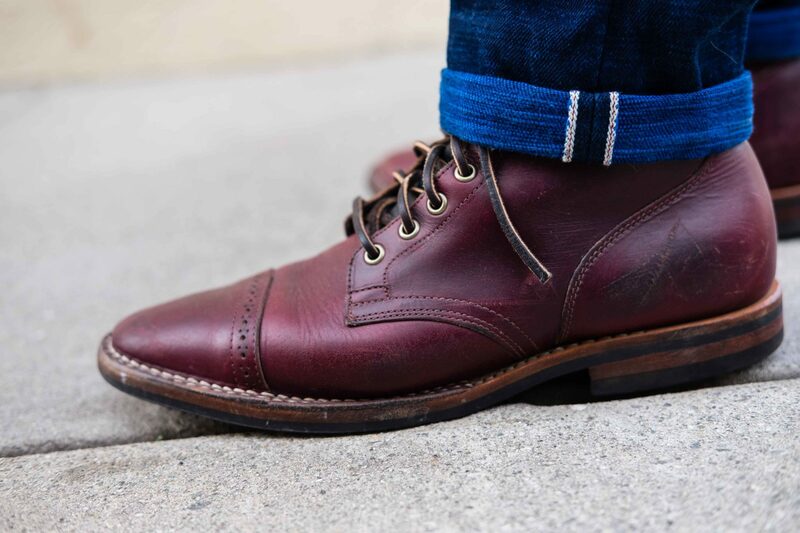 You can choose to beat them up like Indiana Jones or Alden footwear is generally not sleek by any means, but the Indy Boot has a much slimmer toe profile than Red Wings (see my past toebox/shoe sizing post). 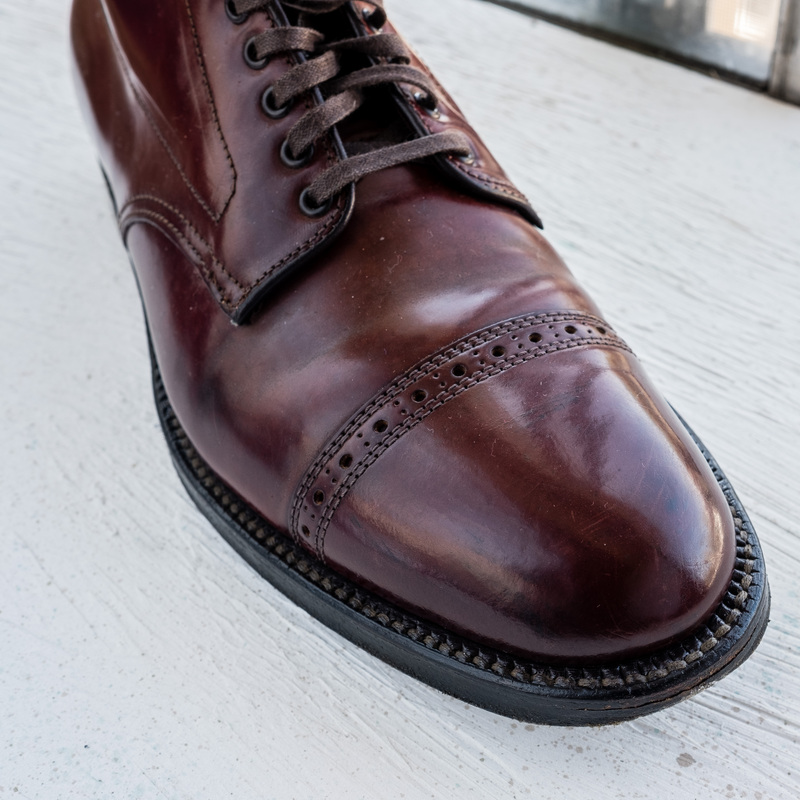 The Neocork Sole and Heel. The original cotton laces included with the Alden Indy. 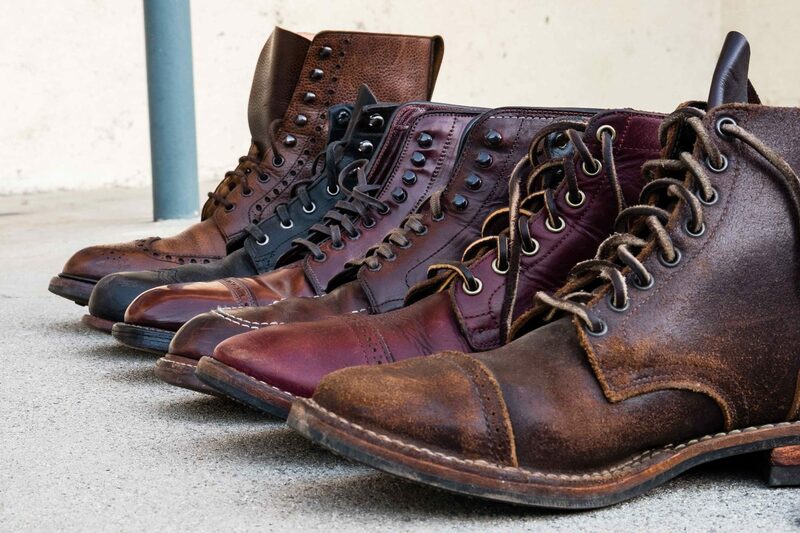 The left three boots have a structured toe box. The differences in toe boxes are minimal with the Vibergs (middle 4) as the 2030 Last is very sleek. In this post, I will try to explain the difference in construction of a structured toe box versus an unstructured toe box accompanied with some pics! The brands included in the following pics are: Meermin, Viberg, Alden, Wolverine, Red Wings, Crockett & Jones, and Common Projects. Viberg Natural CXL (structured) vs Viberg Color 8 CXL (unstructured). Slight collapsing of the left. 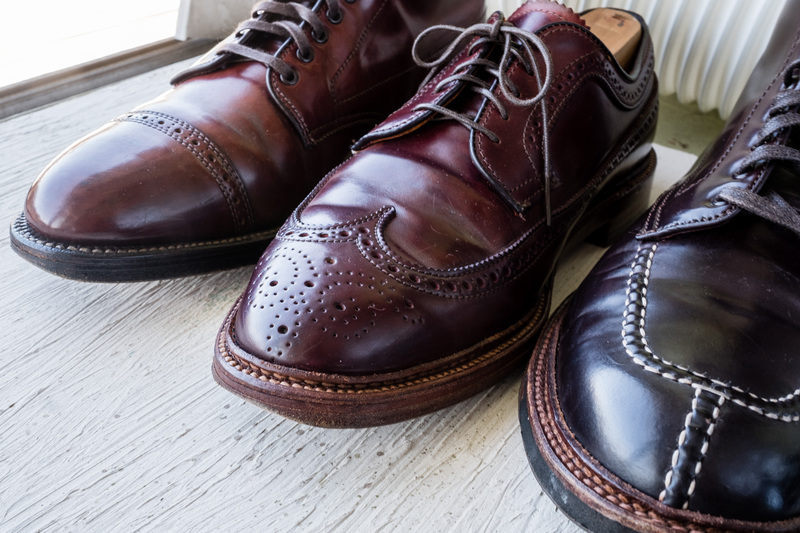 Shoes typically fall within one of three categories: an unstructured toe box, a partially structured toe box, and a fully structured toe box. It’s probably best to compare within a brand because of the varying lasts (mold/shape) between different brands. 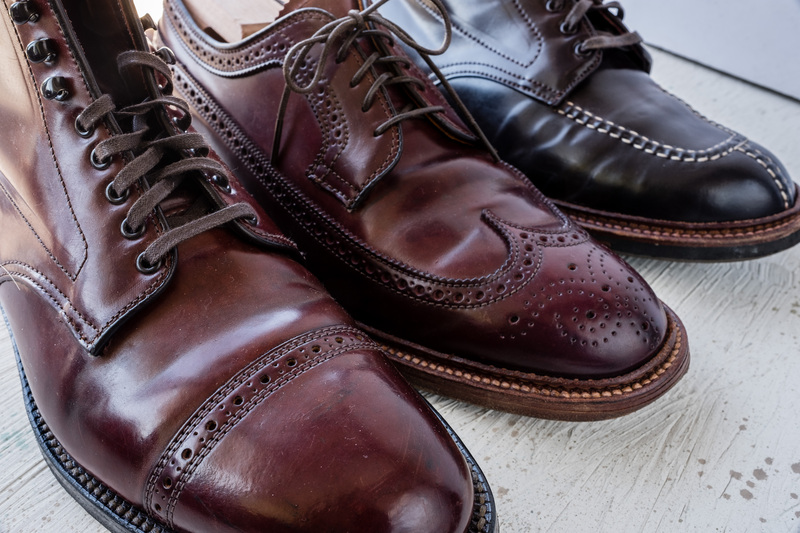 3 footwear with unstructured toe boxes. Alden footwear is typically structured with the exception of their unlined pairs like this Alden 1493 Snuff Suede Chukka. Structured toe boxes typically have a Celastic material, a plastic fabric that is suitable for toe puff material because it is easily shaped during construction, but inflexible once set. Imagine a ping pong ball that you squeeze, but then returns to its original shape. Other common materials used for toe puffs include leather and canvas. The material is placed between the inner lining and the outside material to help maintain its structure. The fine line between between partially structured and fully structured is the rigidity of the toe box material. The recent trend towards slimmer fits in denim and boots has been quite prominent in the recent years. 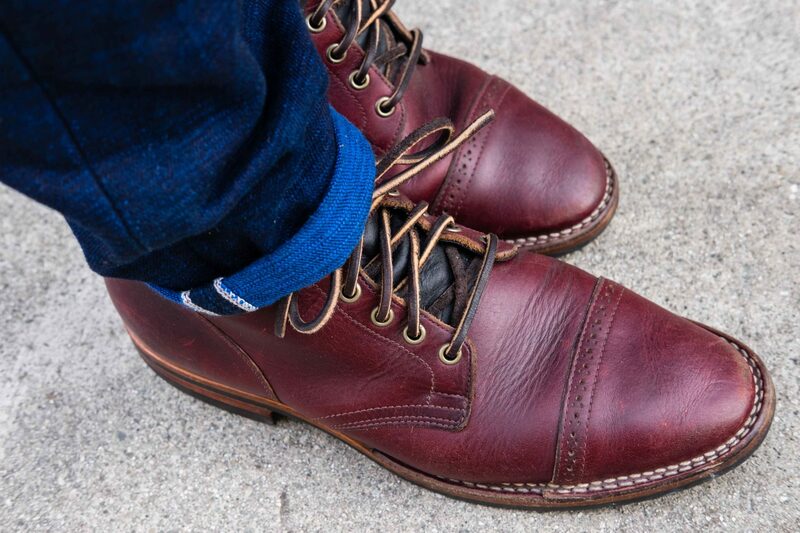 I myself prefer unstructured toe boxes because I tend to wear my denim with a slimmer opening. However, all toe boxes will compress over time with wear, and the major difference is just how the boots look from the side initially. In addition, shoes with “captoes” have an additional layer of material which also may minimize the shoe creasing. Structured on left vs unstructured on the right. 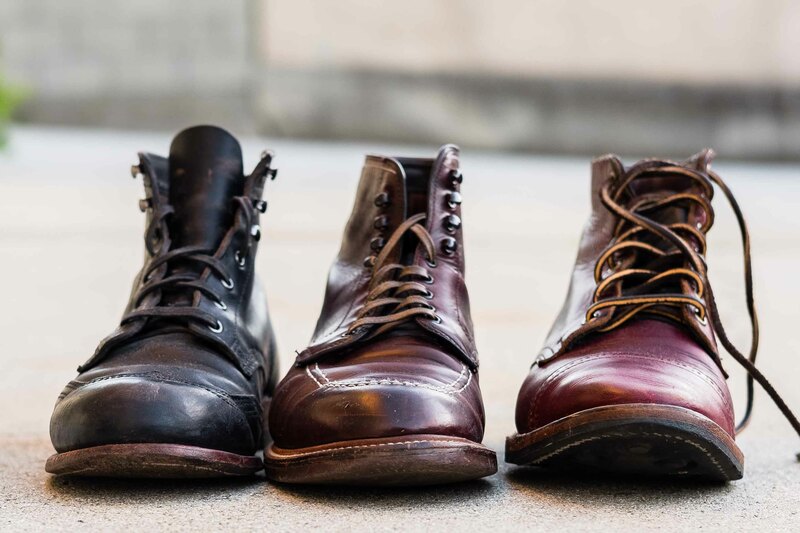 3 structured toe boxes – Red Wing Iron Ranger, Viberg Black Waxed Flesh Service Boot, and Viberg Natural CXL Service Boot. Even structured toes will collapse over time. 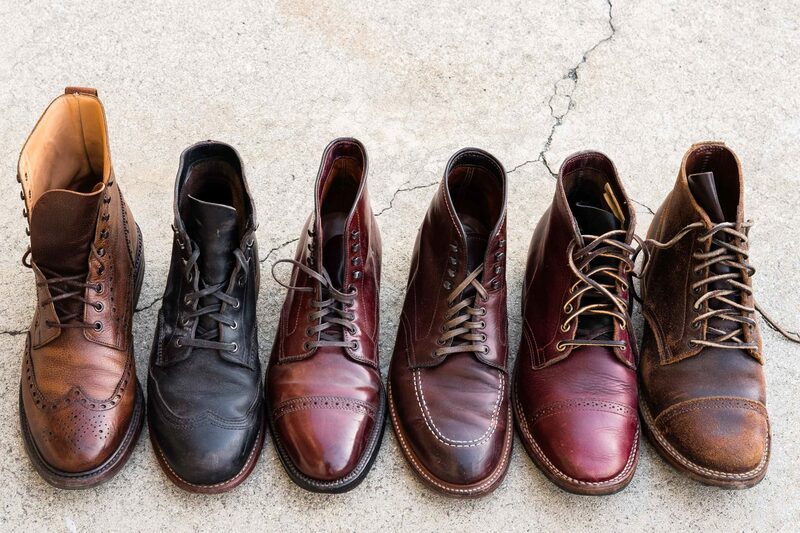 With some companies such as Viberg, Dayton, and Truman Boot Company offering different toe types, it’s hard to make a choice. 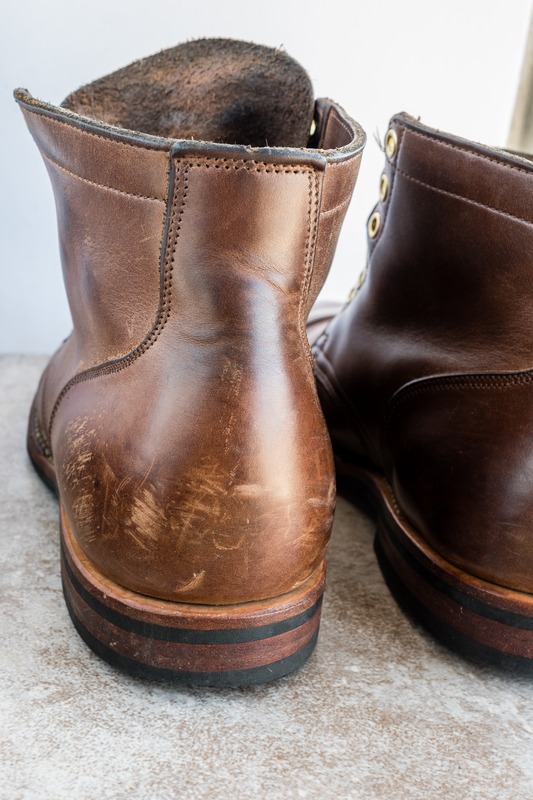 If you have a sedentary job such as working indoors in an office, your boots may keep their structure fine over many many years. 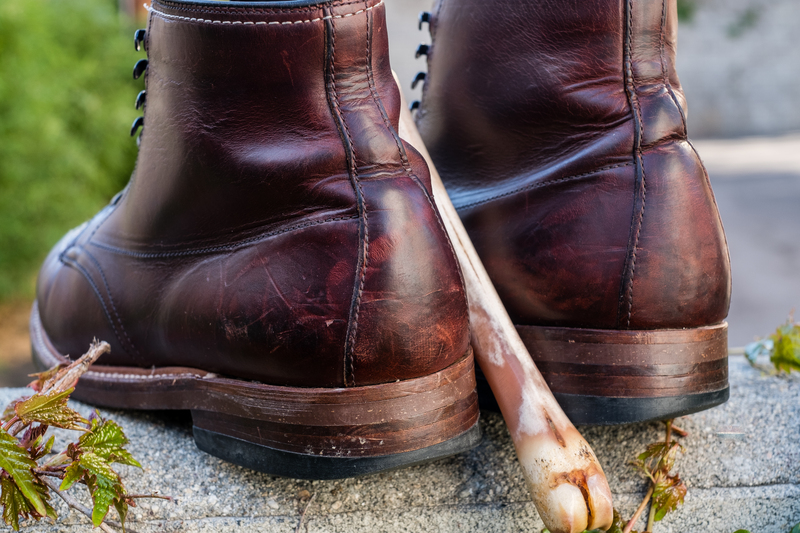 However, if you work outdoors in harsher environments, you may want a structured toe or even a steel toe. Unstructured toes tend to appear more casual than structured ones. Some think that a structured toe leads to a “bulbous, clunky toe”. Red Wings one of the boot companies most notorious for this aesthetic has decided to produce a “Flatbox” model in FW2017 very recently (within the last few months) for the Japanese and Singapore markets. 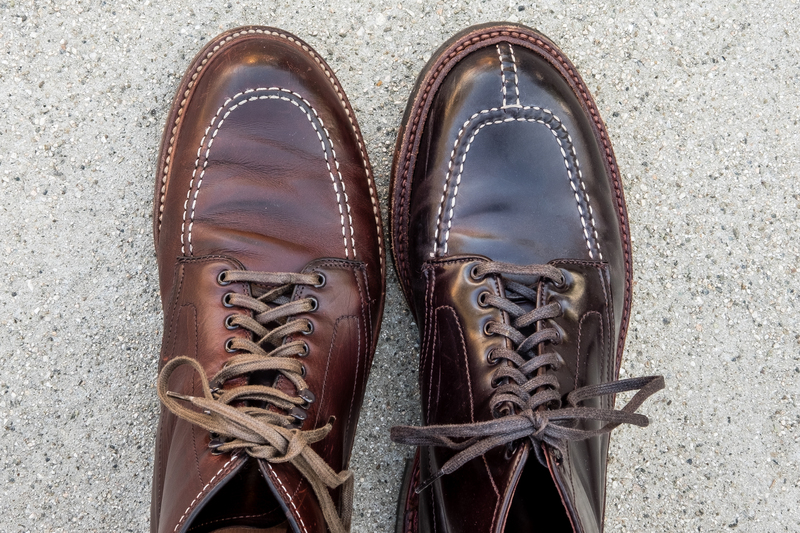 Bulbous structured toe on Red Wing Iron Rangers compared with an unstructured Viberg Boondocker Boot. Some companies even have a relatively a slim structured toebox like the Alden Indy Boot, but regardless, everything will flatten with time. Even my Viberg Natural Chromexcel Service Boots from Mr. Porter with a partially structured toe has flattened out a bit (seen in the first picture). Top view of the Alden 1493 Snuff Suede Chukka vs Viberg Black Waxed Flesh Service Boot laying on their sides. 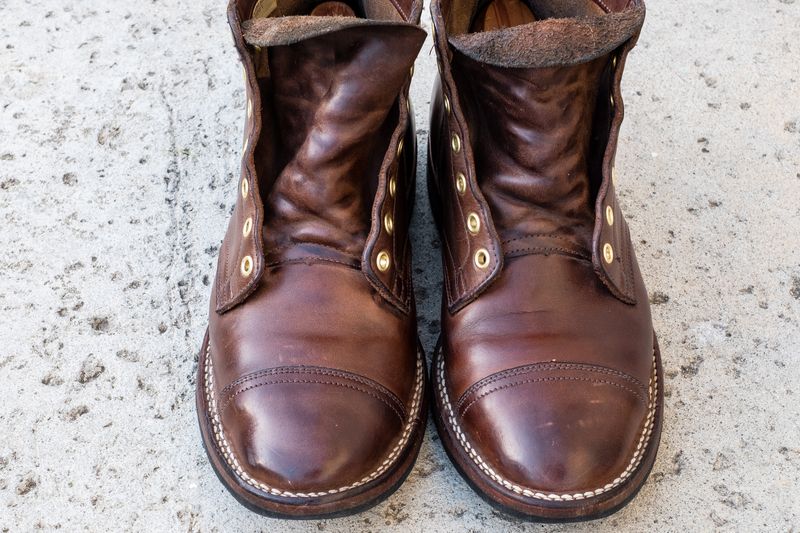 Top view of the Red Wing 8085 Iron Ranger vs Viberg Olive Chromepak Service Boots laying on their sides. 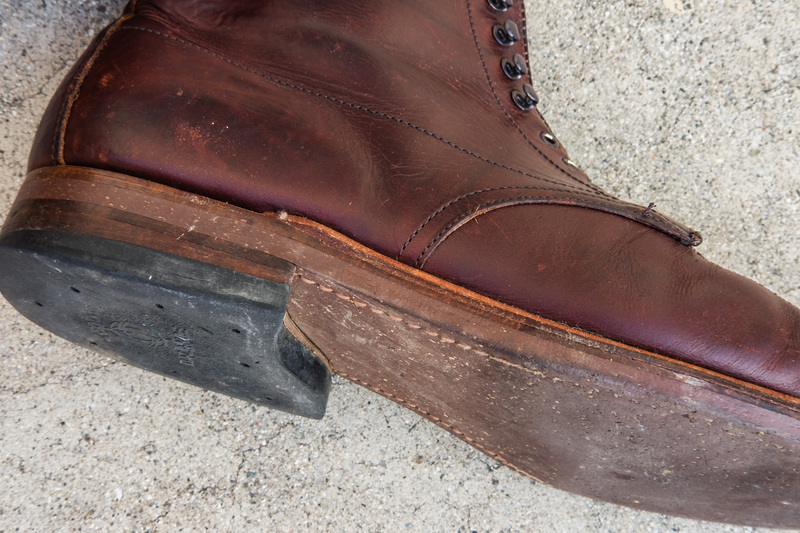 Top view of the Viberg Boondocker vs Viberg Natural CXL Service Boot laying on their sides. My advice is that you should buy footwear because you love exactly how they are, not because of what you expect to happen to them in 1, 5, or 10 years. Just wear them; the story is told later on when as the boot ages. 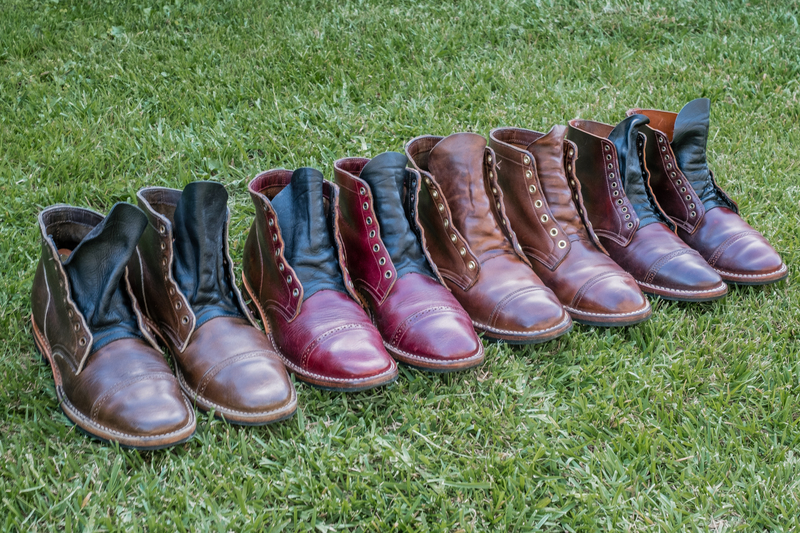 I adore the look of all my boots as its part of the process of wearing stuff in! Here are my shoe sizes including some not pictured that I no longer own. I recommend to measure first using a Brannock Device. The order of shoe sizes listed below is very similar to the order I purchased them in with the oldest starting from the top. I first heard of Viberg through /r/goodyearwelt. 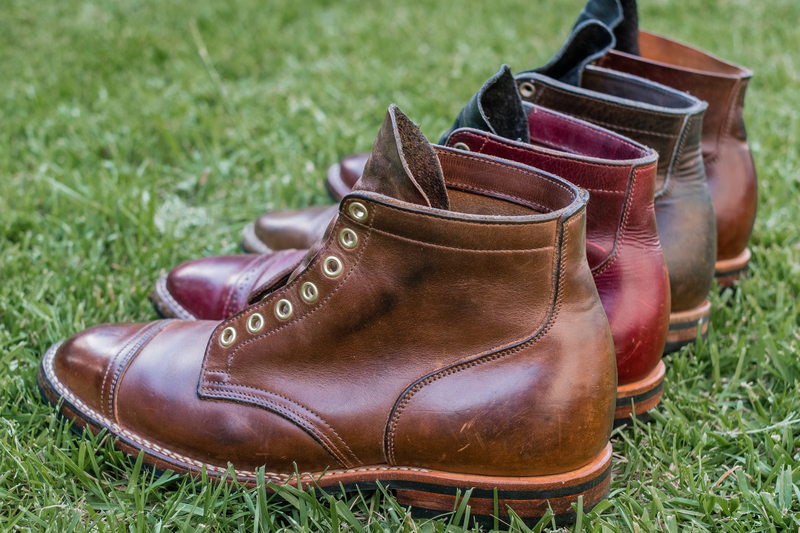 Around 2014, a there were quite fewer number of boot companies around primarily made in the USA – Oak Street Bootmakers Trench Boot, Wolverine 1K Mile Boot, Aldens, etc. 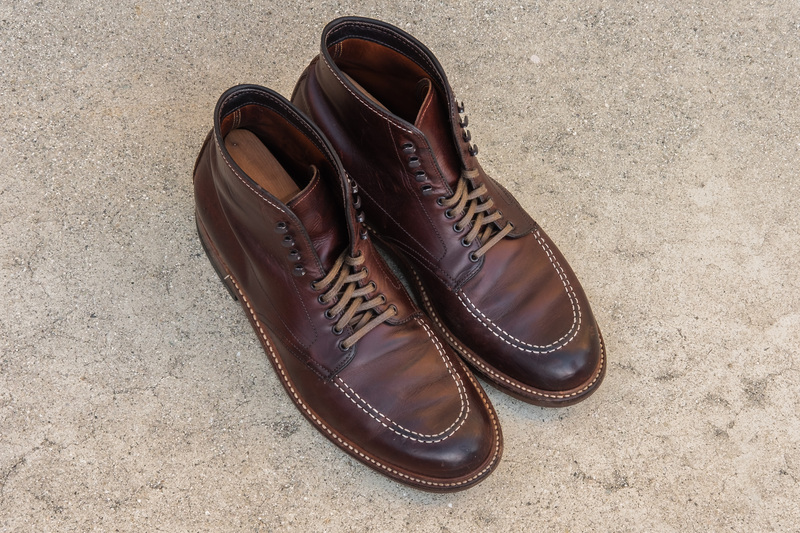 Viberg’s sleekness of their service boots and their quality was mentioned several times. Dayton boots also made in Canada were also quite popular (the black nubuck). By then, I already had purchased Alden Indy 403 Brown Chromexcel, Alden Shell Color 8 Captoe Boots, and wanted a boot that was military looking to go with my style at the time. 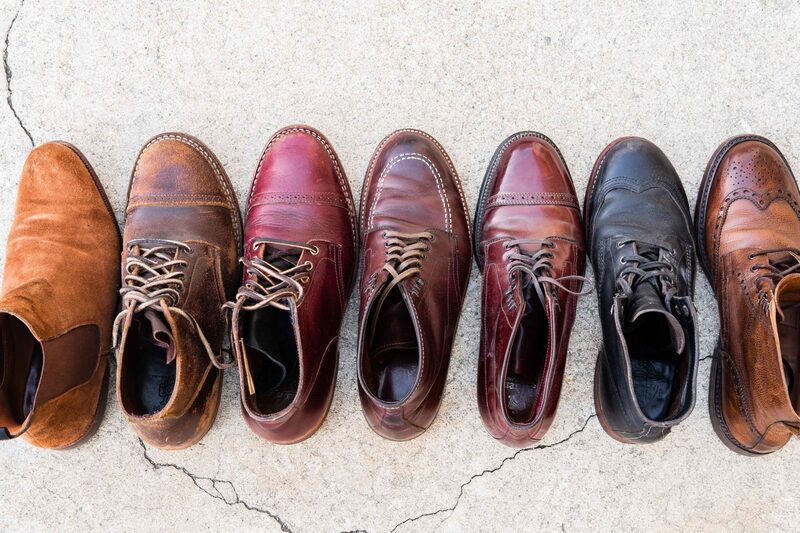 The 3 main colors of service boots that Viberg had on their site was Black, Brown/Icy Mocha, and Burgundy/Color 8. I actually wanted the Icy Mocha (which looks very similar to natural chromexcel), but the site didn’t have it in stock at the time with no estimated time to restock. Between the black and burgundy CXL, I decided with Color 8 CXL at a total cost of $735 USD including shipping. At the time, I thought this was going to be my one and only Viberg boot, so I wanted it the color and style to be as versatile as possible. I had already owned the Alden 403s on the Trubalance Last (9D), and Alden x Jcrew Captoe Boots on the Barrie Last (9D), and was confident I sized correctly in those. The general online consensus is that the 2030 last runs half a size large just like the Barrie and Trubalance. My brannock sizing is 9.5E, so I ordered a size 9. The boots fit perfectly with thinner dress socks and stretched out comfortably to fit thicker wool socks later. I remember the box the boots came in – it was the sturdiest shoe box I had ever felt in my life. Inside came with shoe bags, a handwritten note, and an additional pair of laces. The two pairs of shoelaces included were a flat waxed cotton black shoelace and a brown rawhide leather shoelace. The depth of the color 8 chromexcel was really beautiful, such a stunning color. I don’t remember seeing any flaws that warranted returning. The black contrasting tongue was very thick but yet still soft. I initially wore them with the black flat waxed laces, but later settled on the rawhide laces. The toebox was unstructured and provided a very sleek/slim look from the top and sides. 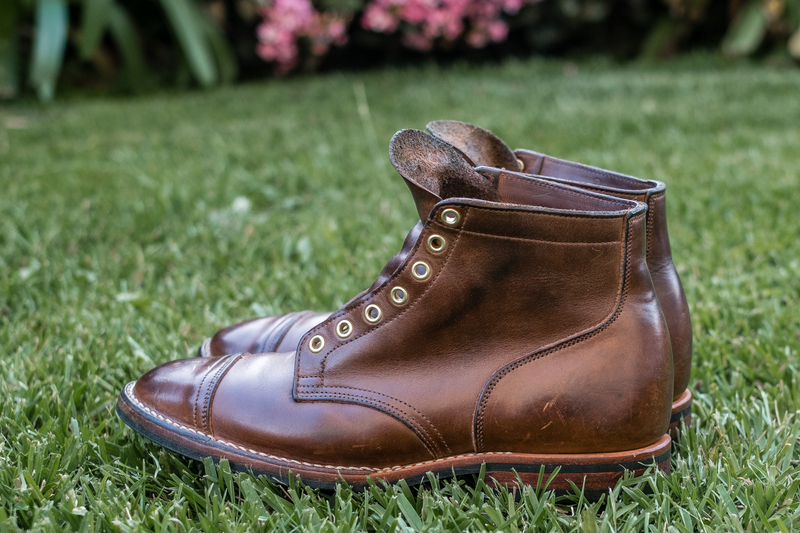 I believe this was the first or second boot that had Dainite soles. However, this pair didn’t actually come with Dainite branded soles. It was actually Itshide which is slightly firmer and less flexible. I had problems with some of the lugs chipping off quite early on within the first couple of wears. I’m not sure why Viberg used Itshide soles for this batch, but in later makeups they switched back to Dainite. I like the soles because they’re really sleek, yet provide enough traction in rain to prevent a slip. After owning them for just about 4 years, I think they were a solid purchase. 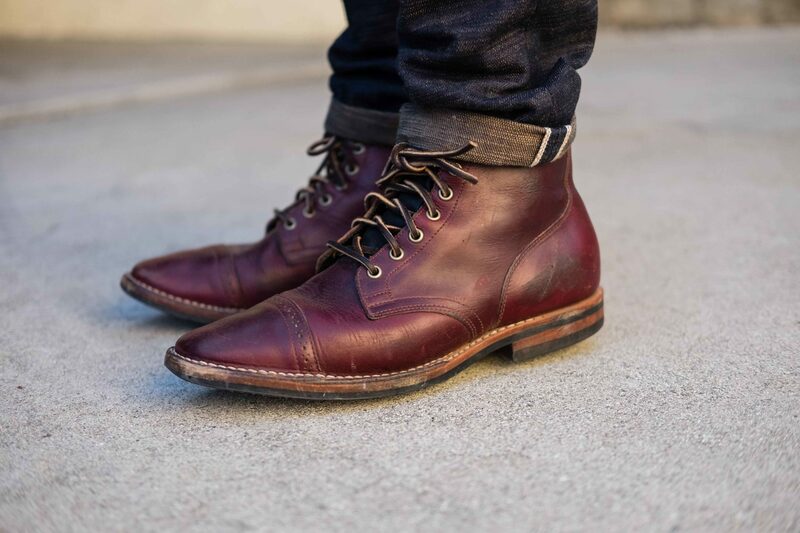 Now that there are other quality boot competitors (Truman, Junkard, Thursday Boots) that also provide a slim last, it’s quite questionable whether Viberg boots are worth $700+. At the time I purchased them in 2014, they were the only company that provided a slim look accompanied with an unstructured toebox. 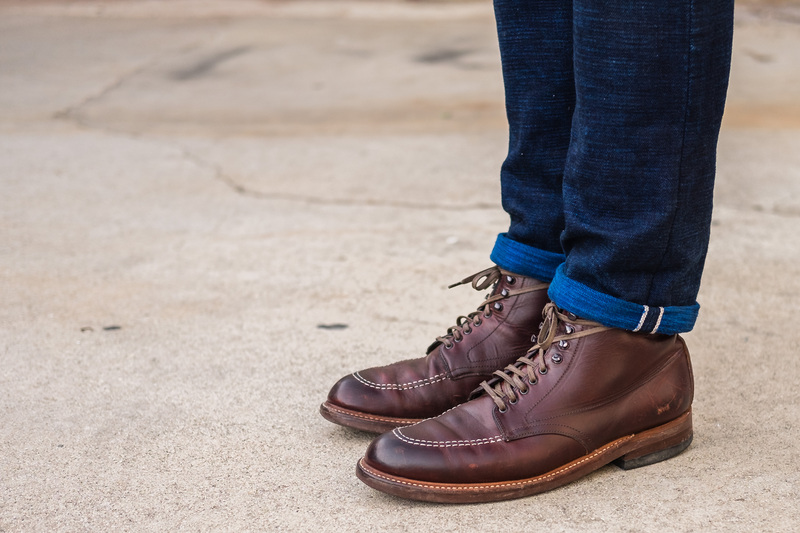 Nowadays, Viberg has ventured into wider territory such as using Italian leathers, switching to goodyear welt, no longer producing unstructured toeboxes (I stand clarified by Frank P. @imustbefrank ! Viberg still produces boots with an unstructured toebox, but as of now all the CXL have a structured toe – may change in the future) , no more contrasting tongues. A lot has changed since then. Right now, I’d price these boots at around $500 new. Viberg hasn’t decreased at all in their quality boots, but now with increased competition in the market, they may not be the “best bang for the buck”. 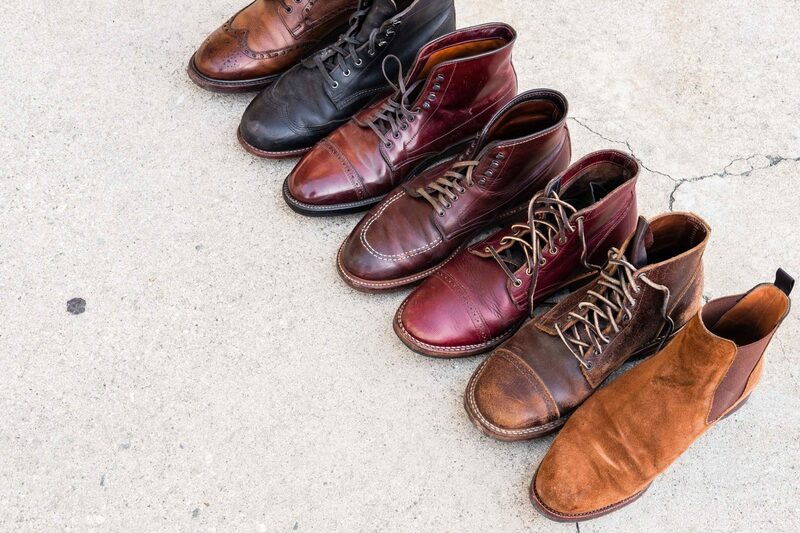 In addition, Viberg has held a couple sample sales where you can get a new pair of one-offs for $400 and below once a year. I’ve also been noticing companies being more liberal in placing them at sale prices such as Mr Porter, Superdenim, and Brooklyn Clothing Co. 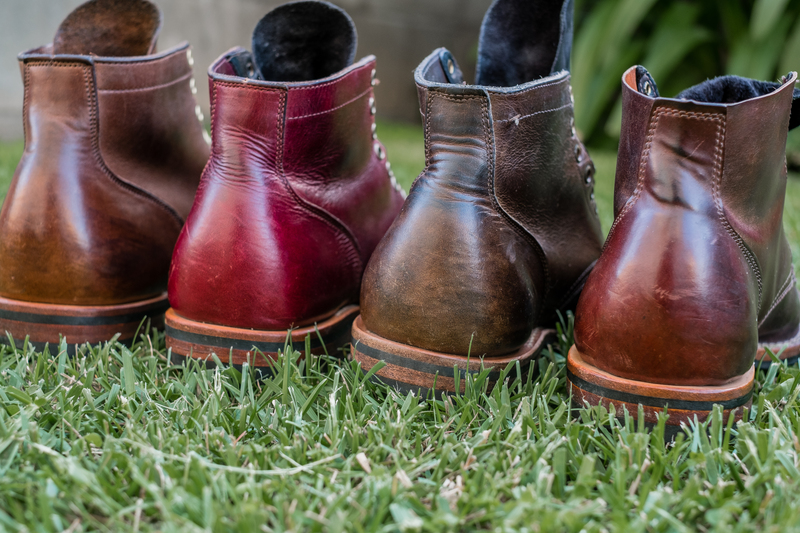 I think the era of Viberg’s dominance in the market peaked in 2013-2015, and now if I had a brand new footwear wardrobe, I’d look into other options such as Truman boots. However, that’s another day’s discussion!